The big day had finally arrived. 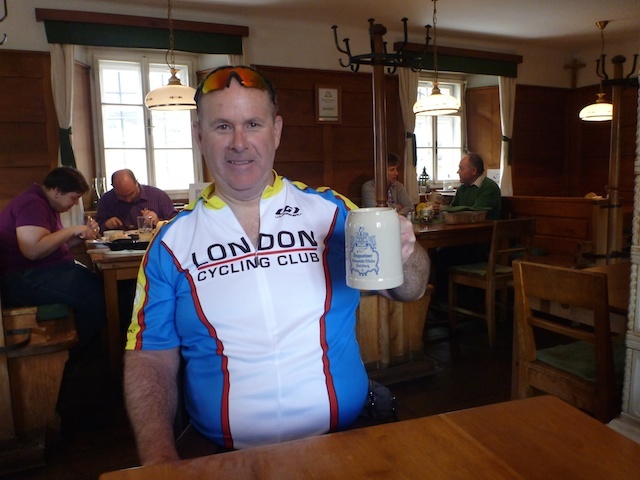 Saturday, May 25 was the day I picked to travel across the Atlantic to meet my two colleagues, Tom Jolliffe and Brent Irvine for yet another European bike tour: Munich to Salzburg via Hitler's Eagle's Nest - formally known as Kehlsteinhaus. Travelling standby as an airline employee seems to be getting harder each year, as flights get fuller and fuller. Originally, it looked like I would have to route my way to Munich via Zurich, Switzerland because there was more room on the flights. If the flight is full - Kevin doesn't go. At the very last minute, I checked the passenger loads on the direct flight to Munich , and was satisfied that I would be able to get on. So I re-booked my flight right at the check-in counter in London, Ontario. 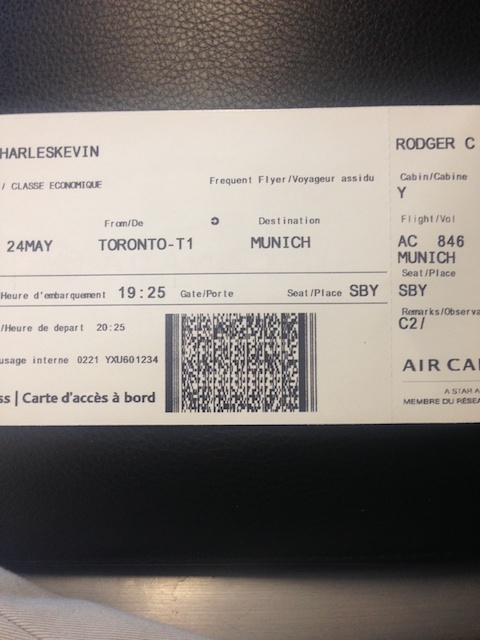 After arriving in Toronto, I spent a couple hours in the American Express Lounge waiting for the departure time of my Munich flight. Standby passengers recieve a "GTE" (Gate Seat Assignment) or "STBY" (Standby) boarding pass if the flight is fairly full. Once the flight is closed, your name is called, and a seat assignment is given to you (provided there are still seats for the agents to assign). It seemed to take forever, but finally I heard my name being called. Air Canada 846 across the Atlantic was an uneventful and actually rather pleasant flight. I had a window seat on the right side of the aircraft next to two rather attractive German girls. 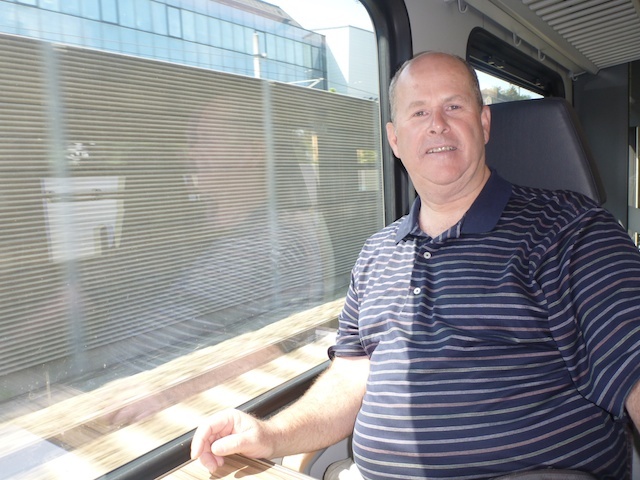 I slept a good portion of the flight (hopefully no errant snoring disturbed my two seat mates), so was feeling rather "refreshed" for my short ride to Pfaffenhofen, where I would be spending the night with my friends, Birgit and Eric and their two sons, Bene and Justin. 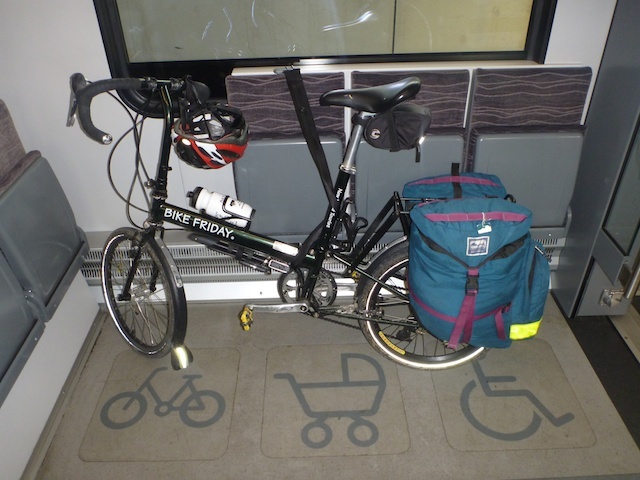 After proceeding through customs I retrieved my luggage, which included my bicycle - a foldup Bike Friday New World Tourist, that I had ridden on my last two trips to Europe. 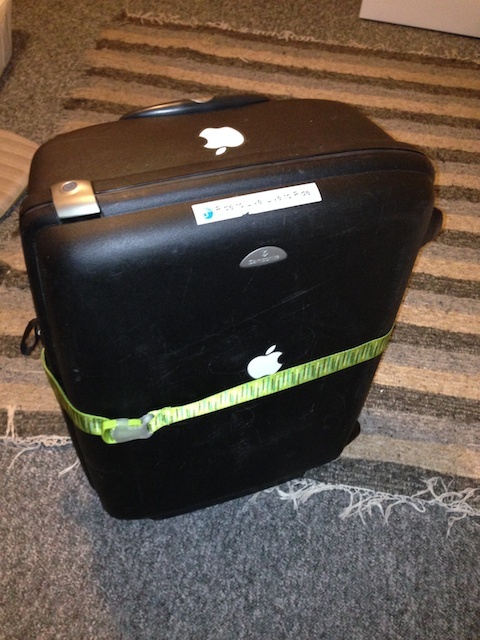 I planned ahead of time to leave the case for my bike at "Left Luggage" at the Munich Airport. The Left Luggage area proved very easy to find, and I was quickly reassembling my bike in front of this business. 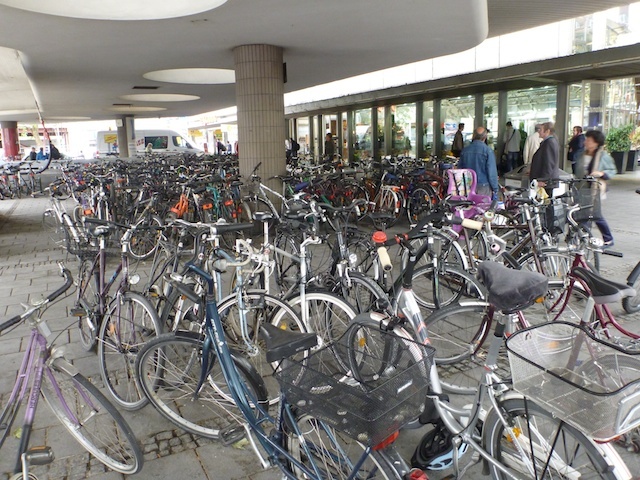 While the bike assembly was reasonably quick, it was not without its problems. 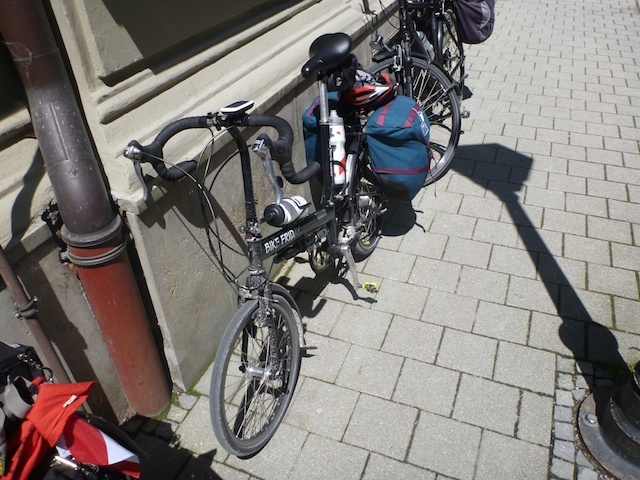 The folding rack for the rear of the bike to which I attach my panniers did not look right. Several disassemblies later, I still was not satisfied with the result, but I resolved that I would learn to live with it. 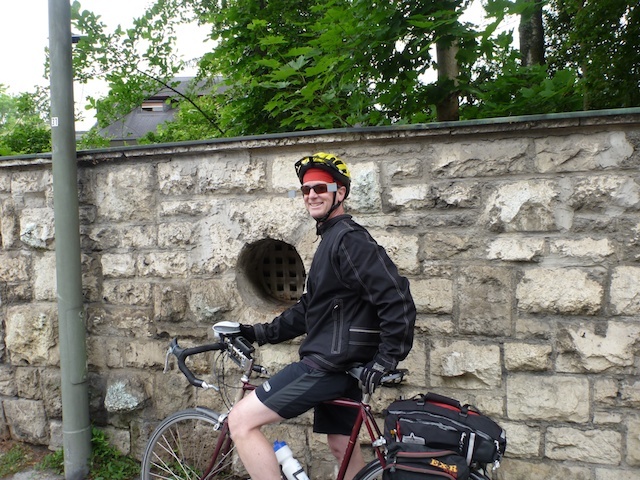 The panniers did not attach properly, requiring constant minor adjustments throughout the trip. After about an hour and a half I decided to leave. I picked up some water and pretzels at a nearby bakery, and headed towards the exit just down the hallway to start my journey. 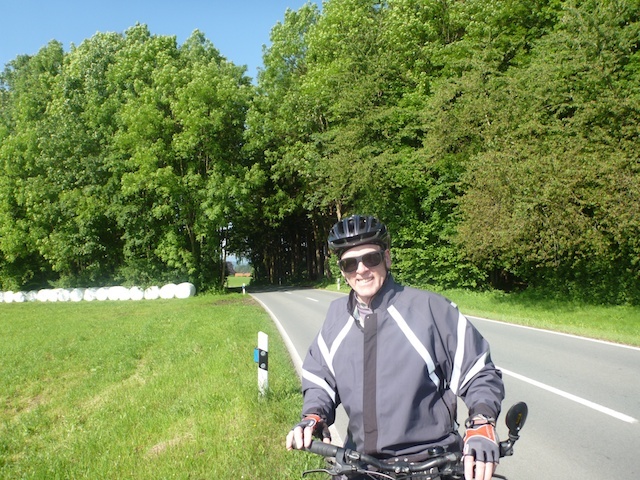 The weather was warm and sunny - perfect for cycling! 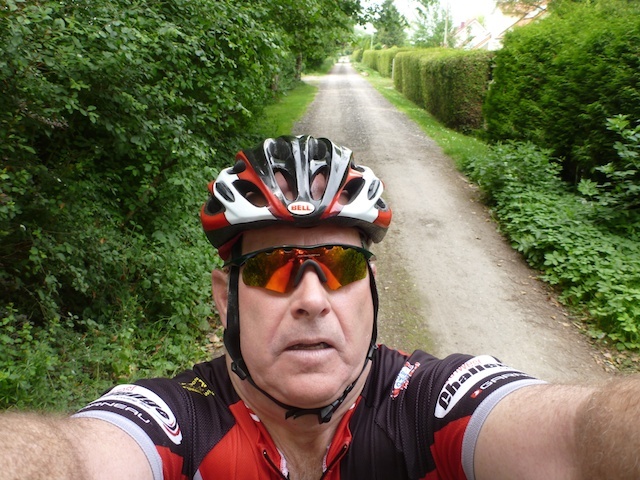 I fired my newly aquired Garmin Edge Touring GPS, loaded the map for Pfaffenhofen and started on my way. 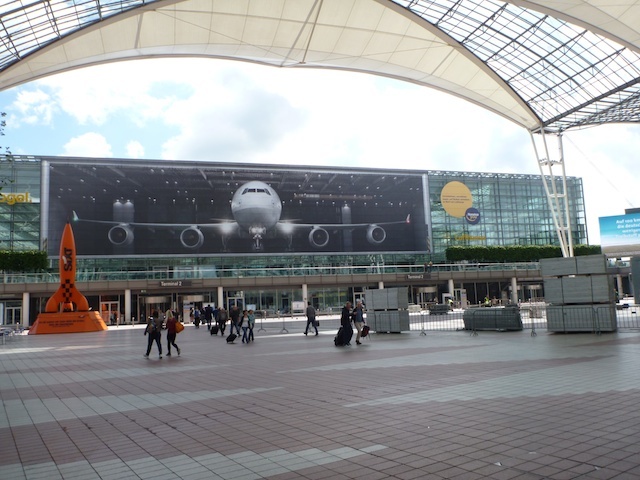 Even though maps of the Munich Airport make it appear rather "small", this is one big airport. The GPS seemed to keep turning me in circles. I even consulted the large scale cycling map several times. 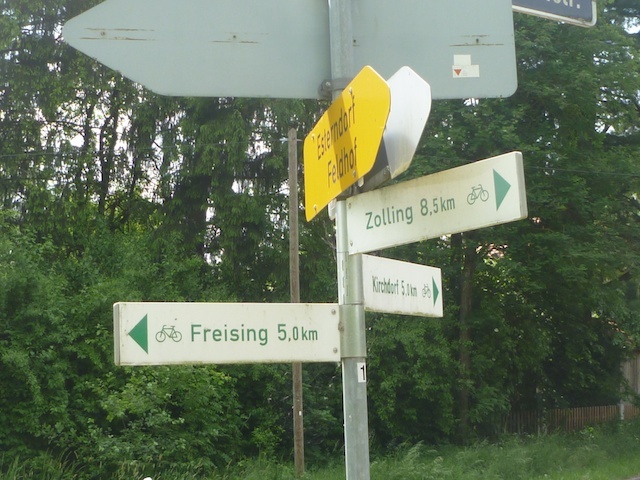 After several attempts to leave the airport unsuccesfully, I simply followed the road sign, and turned off in the direction of Freising, the first major town on my route. The road I took turned out to be rather busy, but as it had a reasonably wide shoulder, I continued on. The GPS kept on directing me to make a "u-turn". This proved impossible to accomplish, as there was a cement barrier between the two highways. After about a kilometre or so of riding, I could see I was paralelling the road I should have been on, but there was a high barrier fence preventing me from making my way over. Just up a small hill was a van stopped on the side of the road. The driver lowered his window and indicated to me that I should not be on this section of highway, as the Police will ticket me. 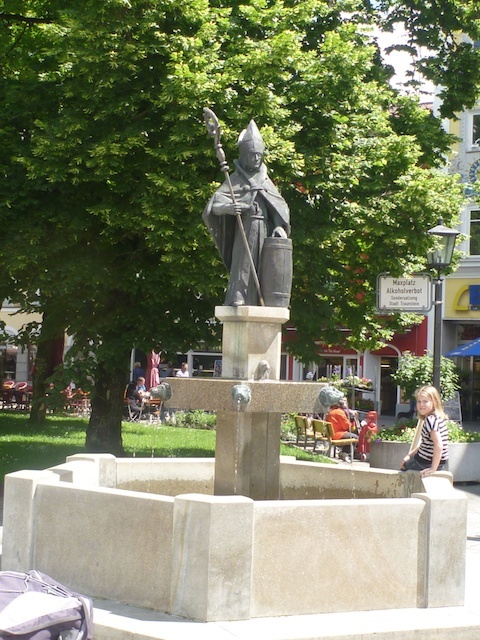 He offered to give me a ride to the start of the bike path into Freising. 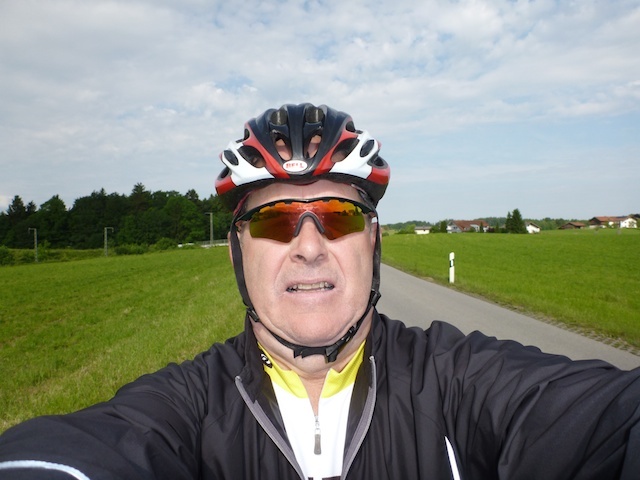 After a short 3 km ride, I thanked the driver and was on my way into Freising. Later, while examining my GPS download of my ride, I was elated to find I had finally broken my record downhill speed of 79 kph - and on my small wheeled Bike Friday. I had bragging rights, and I was determined to use them. For the life of me, I could not remember the spot where I had attained this record. 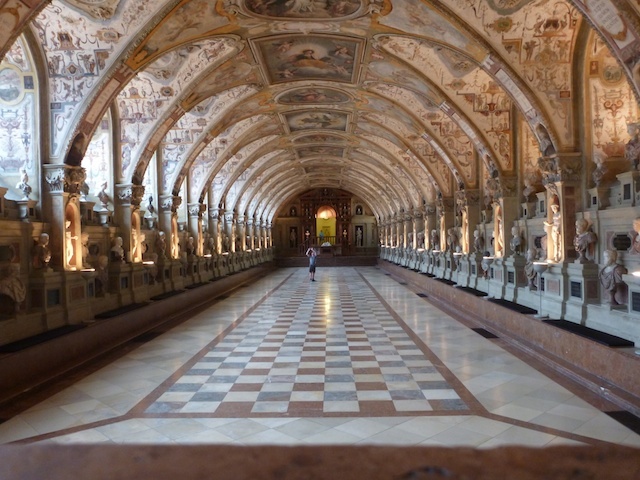 It was only when I arrived back home in Canada and did a more thorough examination of my route that I discovered I was actually in a van leaving Munich Airport when this occured - I had forgotten to turn my GPS off for this short leg. The record breaking would have to wait for another day. 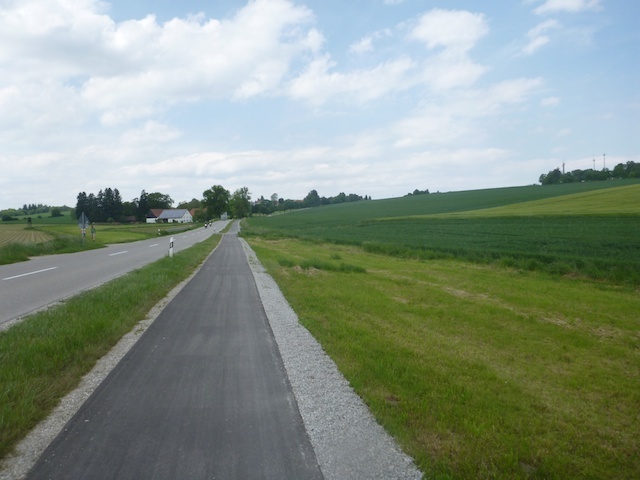 The rest of the ride into the beer town of Freising (they actually have a "Beer University" located here, as well as Weihenstephan - the oldest brewery in the world) brought me along quiet roads, and cycle paths. 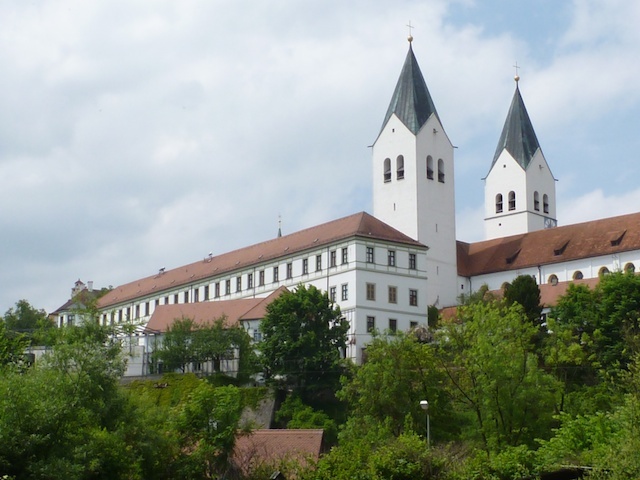 I had been to Freising twice before to meet my friend Birgit. 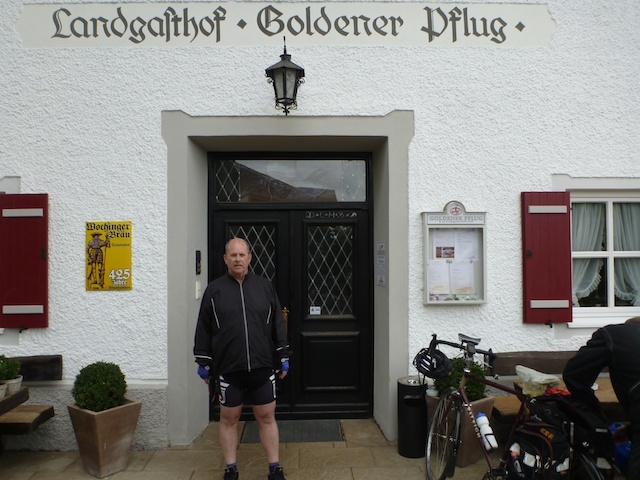 One time just for a visit, the second on my first cycling trip in Europe - Frankfurt to Munich via the Romantic Road. 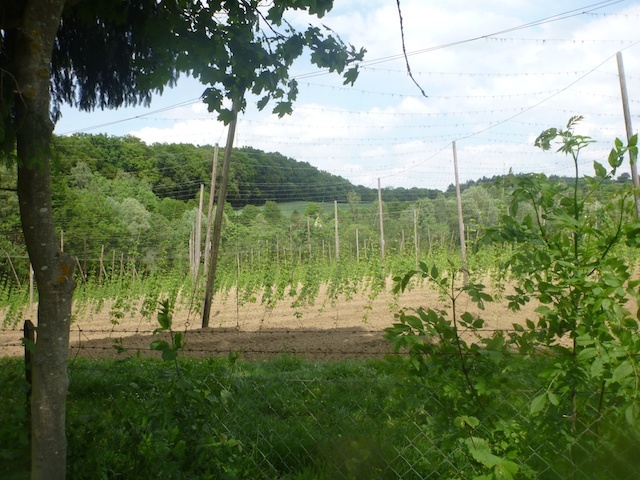 On exiting the town, I followed a bike path for part of the way, then was taken to quiet country roads through fields of hops. 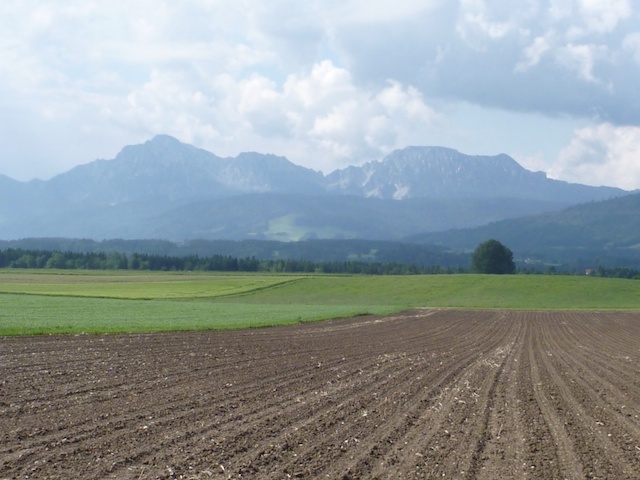 The terrain for the most part was gently rolling, and if you didn't look at the signage in the German language, you could almost imagine you were in rural Ontario. 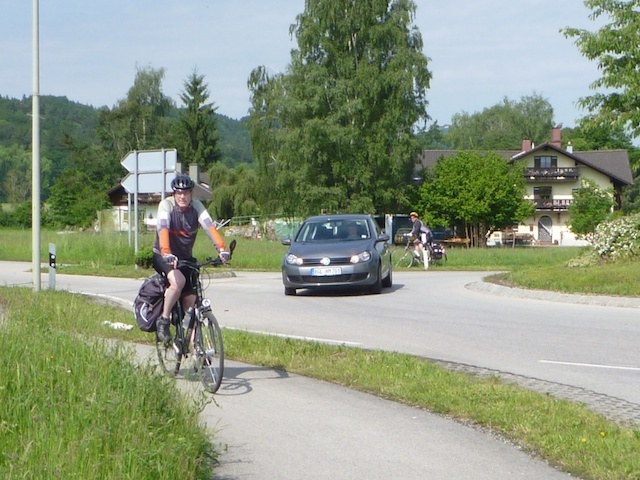 Many roads had an adjacent paved cycle path, which made for rather pleasant, vehicle-free cycling. At about the half way mark of today's trip - 25 km I crossed the River Amper. 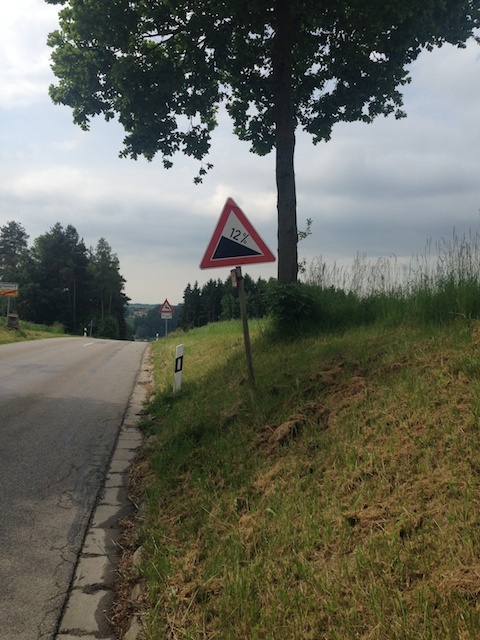 This was in a wide valley, with fairly steep sides reaching upwards of 8% in grade. On reaching the northern side, I had to dismount and walk my bike up part way. Even pushing the bike uphill was slow and exhausting. 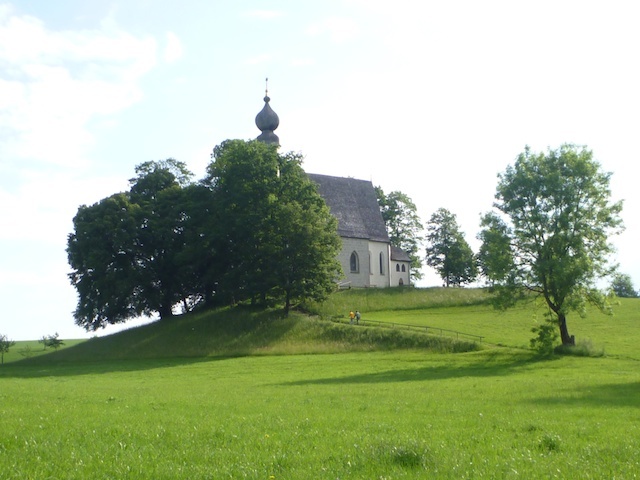 Seven kilometres later I came upon the town of Sweitenkerchen. Here I consulted a map on a billboard to get an idea of where I was. Another cyclist came out of a church and gave me some advice on how to cross the busy north-south E45 expressway, but it seemed to invlove dirt paths. I decided to simply follow my GPS. 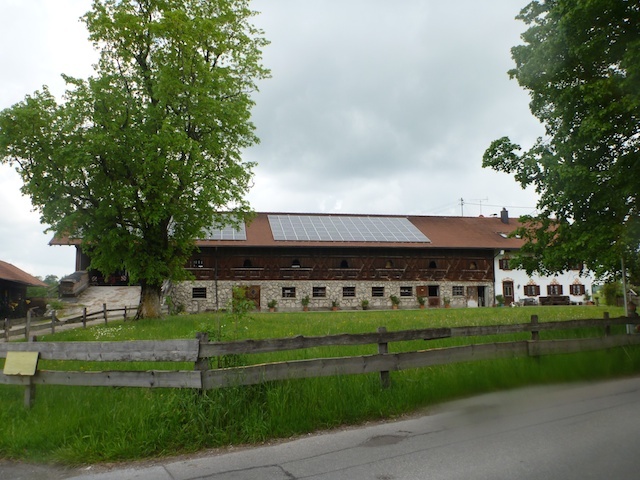 Getting close to the expressway, I started to doubt myself, but like magic, the Garmin commanded a right hand turn onto a bike path that took me through a small farm village onto Giegenhausener Strasse, over the busy road to the other side. I rode by a rest stop obviously designed for vehicles using the busy expressway: there was a rather large McDonalds Restaurant on the property as well as sever gas stations. Pfaffenhofen was getting close. 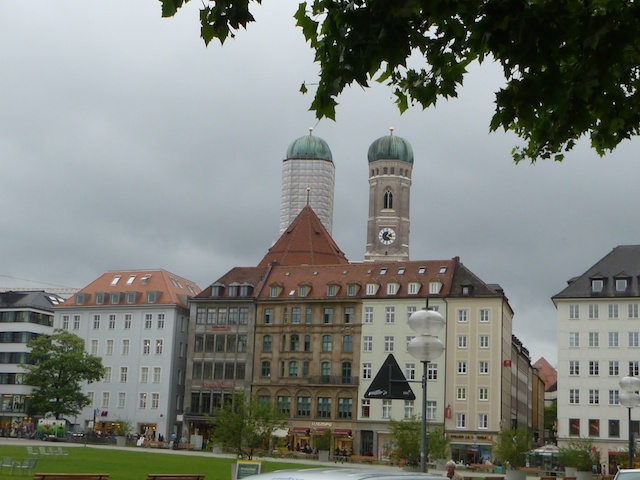 It is funny how rather large towns in Germany just seem to happen. First you are riding in countryside, then before you know it, you are in a residential area. Pfaffenhoffen was no exception. The Garmin GPS did an amazing job! 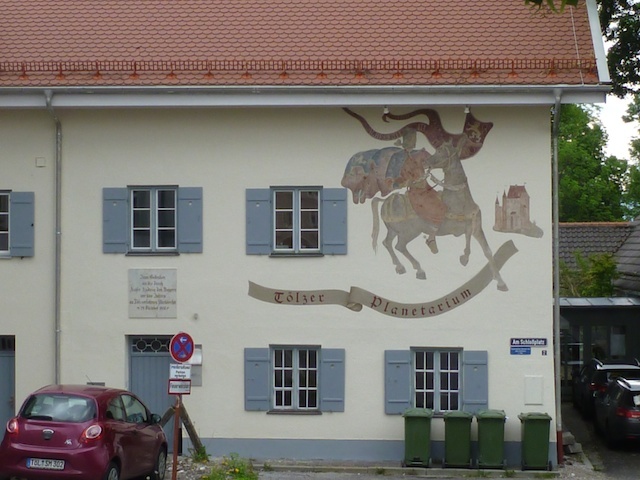 I had never been to my friend's house in Pfaffenhofen before, so really wasn't sure what to expect. I started slowing down as the "checkered flag" appeared on the GPS, indicating I was approaching the finish line just as Birgit appeared from the third floor window to greet me. My day was done. 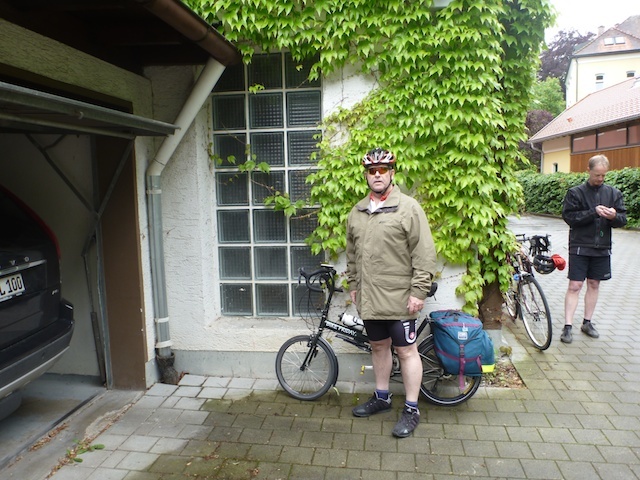 Shortly Eric, Birgit's husband met me on ground level and spirited my Bike Friday to the underground parking. 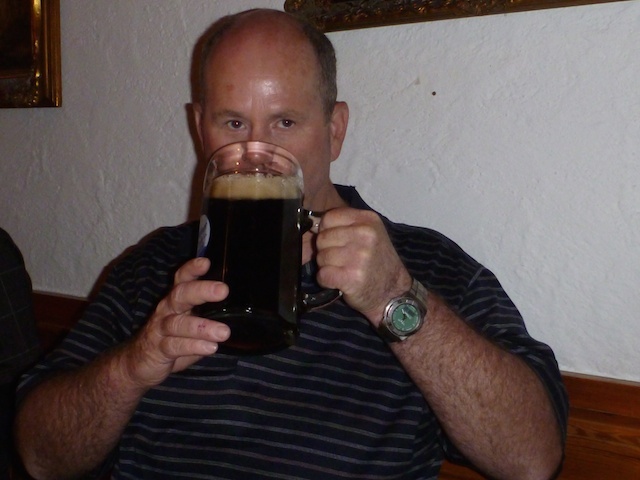 A beer was presented to me, and after a welcome shower, dinner was served! Birgit presented me with a traditional Bavarian dinner consisting of pork loin, dumplings, and boiled cabbage. 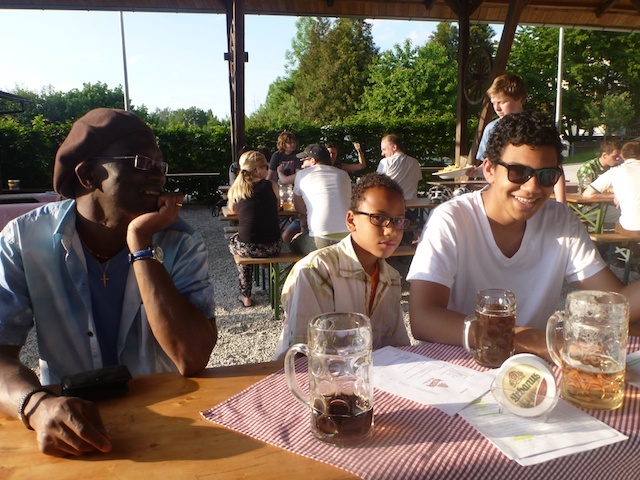 Afterwards, the whole family took me out to a traditional beer garden where we enjoyed some rather large Maß dunkel weissbiere - a one litre mug of dark wheat beer. Mmm ... delicious. Bike Friday All Packed Up and Ready to Go! Rain started during the night - thunderstorm with lightning style rain. I was not impressed. My vacation was quickly going to hell in a handbasket! The entire week was threatening rain. And I did not bring much in the way of rain gear - no booties, no waterproof pants ... nadda! When I woke, however, it was a different story - the rain had stopped, and the roads were starting to dry. Justin (my friend's youngest son) started school very early (at least by North American standards), and because of the weather Birgit gave him a ride to school. She returned with plenty of time to serve me an ample breakfast. 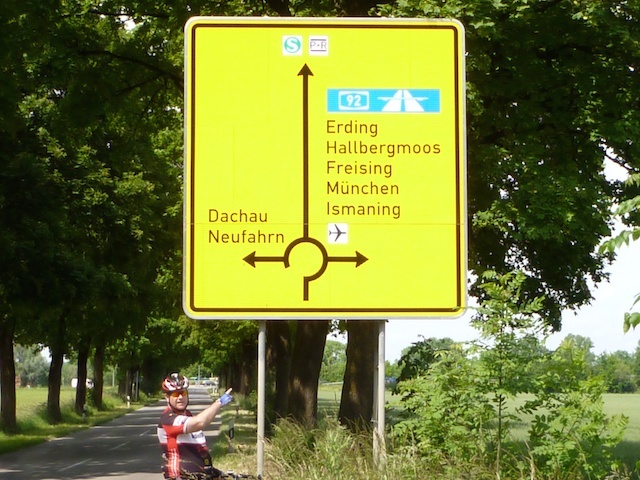 I started my ride today at 10:00 am and could not find my preloaded route to Munich on my GPS. So I simply added the hotel address and ... Bob's your uncle. 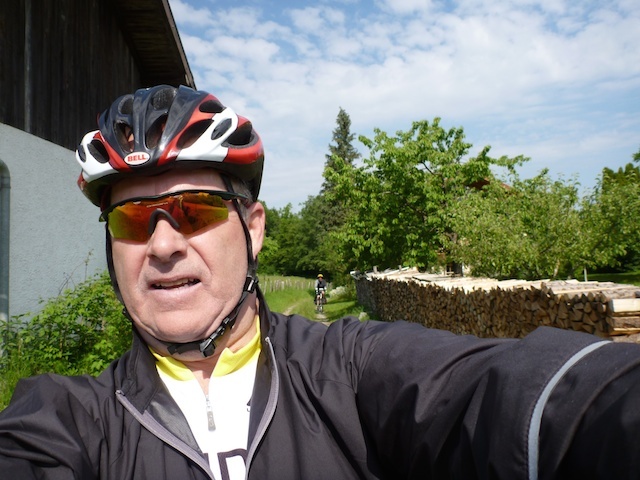 The Garmin Edge Touring GPS is designed for bikes, so it will not put you on major roads, and therefore I ended up with a very scenic, although very, very hilly route (I did not realize this until the ride started). Grades were in excess of 12% on some hills. Thank goodness they were not long, protracted affairs. Birgit and Eric indicated that if I cycled by the Beer Garden we had visited the night before, I would be on the correct path out of the city. I never did see the Beer Garden, although I initially started off in that direction. 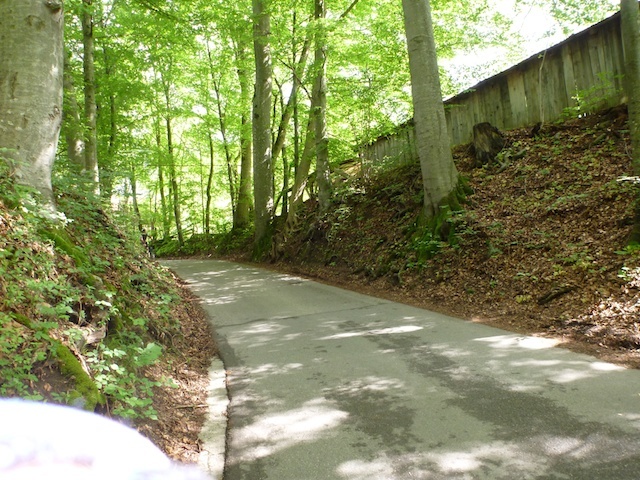 The route out of Pfaffenhofen actually took me up a very steep road through a forest that eventually turned into a dirt road. What have I go myself into? At the top of the hill the pavement returned, and the road took me through village after village set in the middle of palatial countryside. Farms were right in the middle of the towns. There were very few cars on the small roads. There were a few quirks with the GPA, as it tried to take me down horse trails, but it would quickly calculate an alternate route. I was pleasantly surprised by the routing it supplied (with the exception of he hills). As usual in a country sporting a language other than English, you run into some interesting place names. 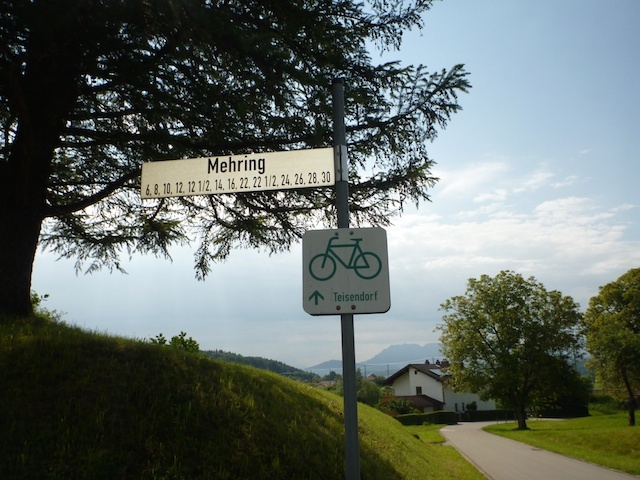 For example, the day before on my ride up to Pfaffenhofen I rode by the town of "Schnotting". Thankfully, nobody was blowing their nose! 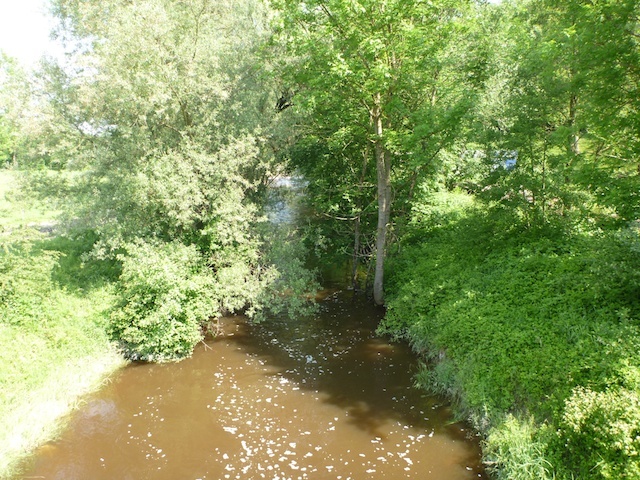 Eventually, once I got on the south side of the River Glonn by the town of Peterhausen, the hills started to subside. Only 20 km to go! With only 15 km remaining my bike started to act up. The gears seemed to mis-shift, and I was forced to downshift, then up shift again or the chain simply spun around the large chainring. I was worried the problem might be with the internal hub on my bike. This would have been bad, as a replacement part would most likely be very difficult to find on short notice. Eventually, the chain fell off and I had to pull off the road to put it back on. In order not to get my hands dirty, I ripped a leaf from a nearby brush. Immediately, my fingers experienced a burning sensation, and I quickly dropped the leaf. Obviously, a bad German plant! 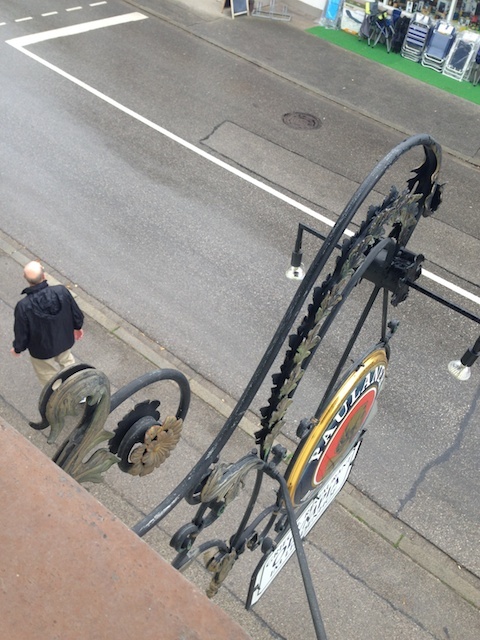 In any case I got the chain back on the bike, and was able to proceed into Munich at a moderate pace of 20 kph. 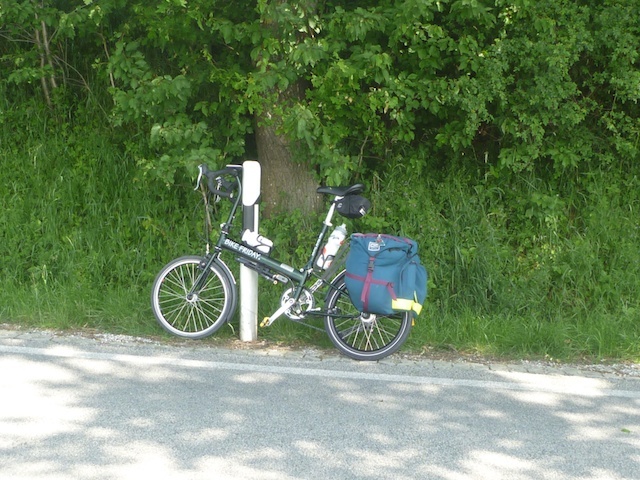 Luckily, the roads were flat by this point, and I was coming into the outskirts of Munich. If need be, I could always get a taxi to the hotel. Ten hours later my fingers were still burning. 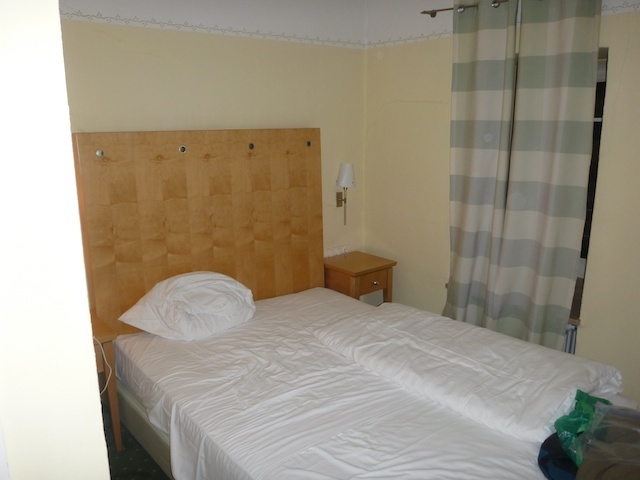 I arrived at the Suite Novotel Parkstadt Schwabing Hotel, Lyonel Feininger Strasse 20, 80807 Munich at 1400 hours. There were some twists and turns in the city, some of which I missed, but the Garmin quickly recalculated. It took a bit of getting used to the multitude of little turns it produced as it tried to keep me on cycle paths or quiet roads. 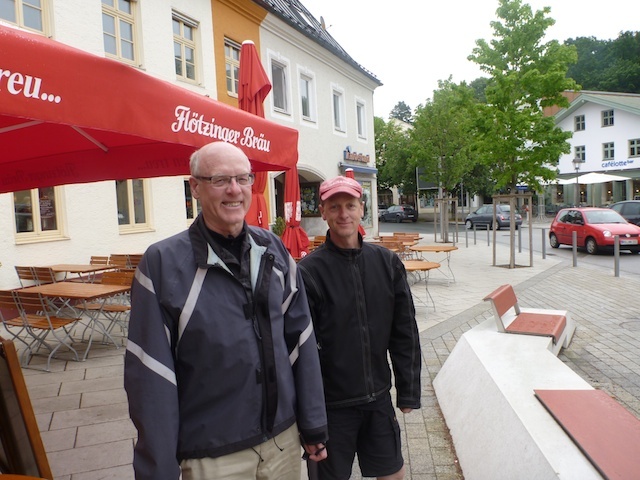 My two cycling buddies, Brent and Tom were waiting for me at the hotel. 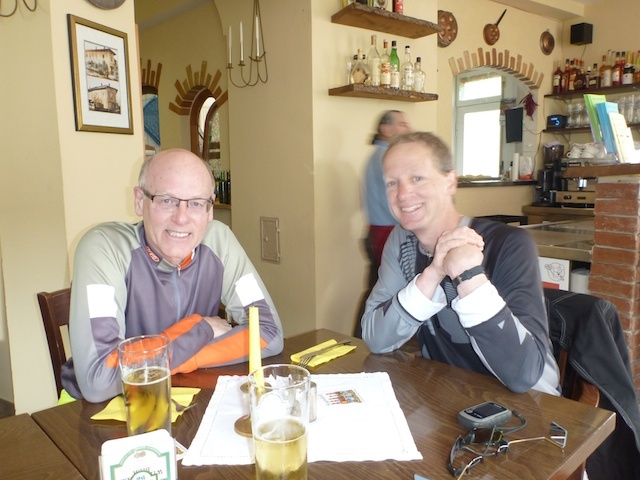 Tom had arrived from a cycling excursion through France, while Brent had come in from Zurich. After settling in and unpacking, Tom and I cycled into town looking for a bike shop. All seemed to be closed on Monday. After the third closed shop, Tom took me down to the bike shop where he rented his bike from - Radius Cycles. This shop was attached to one of the main train stations, making it convenient for Tom to pick up a rental bike at the start of the tour, and drop it off at the end. The two gentlemen who worked there spoke excellent English. Of course, since one was from New Zealand, it was no wonder. They were fascinated by my Bike Friday fold up bike. They knew where it was made, and seemed to be quite knowledgeable about the different models that Bike Friday made. In no time at all (it really didn't matter, since Tom and I went out for a quick beer) they had a new chain installed on my bike, and we were good to go! Thirty Euros well spent (including tip). The dreaded 12% sign - only this one is for downhill - I LOVE it! 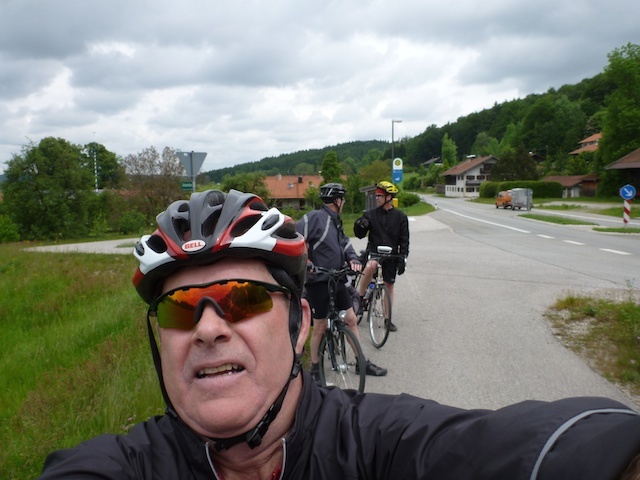 We started our ride direct from the hotel after a €17 breakfast at the hotel that consisted of typical German fare: breads, cheese, meats, as well as eggs, fruit and cereal. When I say "we", I should reiterate that Brent did not partake in this expensive endeavour. He instead saved his hunger for a coffee shop down the road. The day was once again threatening rain showers, which fortunately never did materialize, but it was a bit cool and windy at the start of the ride. 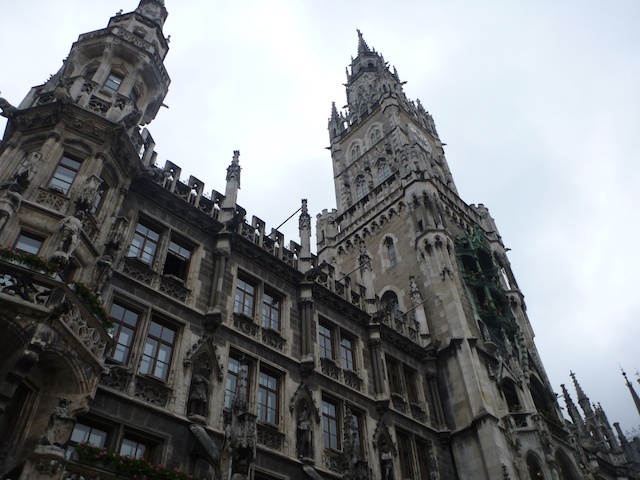 Our GPS took us on a meandering route out of the city through the Marienplatz, along the Isar River and then through the city outskirts. Along the outskirts were some very posh mansions. Sadly, we never stopped to take our pictures in front of any of them. Too eager to get on with the day's ride, I guess. Brent, however kept on stopping at bike stores along the way looking for a bell for his bike, but met with little success. Those he found in his desired price range did not fit his handlebars, those that did fit were in the €15 range. Eventually the route took us into the countryside, and Brent started to recognize some of the area he had travelled a few days before. We took one of his "shortcuts", and it took us through a delightful town with a pond. We stopped at the local grocery store for some pastries and juice. The proprietors even set up a table inside the store for us where we could eat the pastries. Soon we were on our way, going up a rather large hill to get out of town. It was probably a 10% grade. Going down was a delight! The route from Munich overall did not feel too bad. 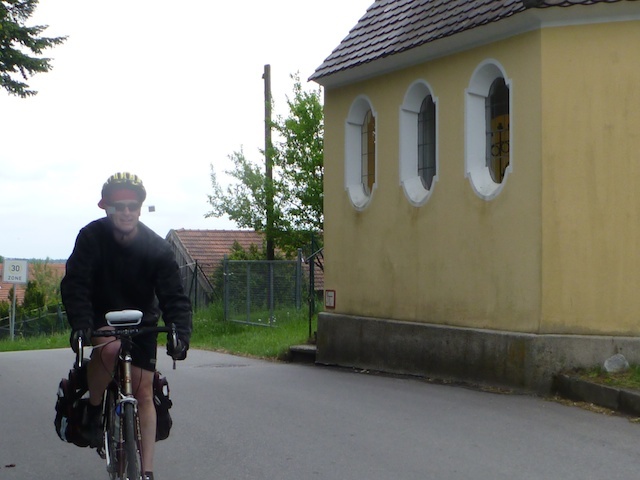 It was a very gradual climb which did slow our average speed down to about 18 kph, but it was not onerous. Traffic along the route also was not difficult. 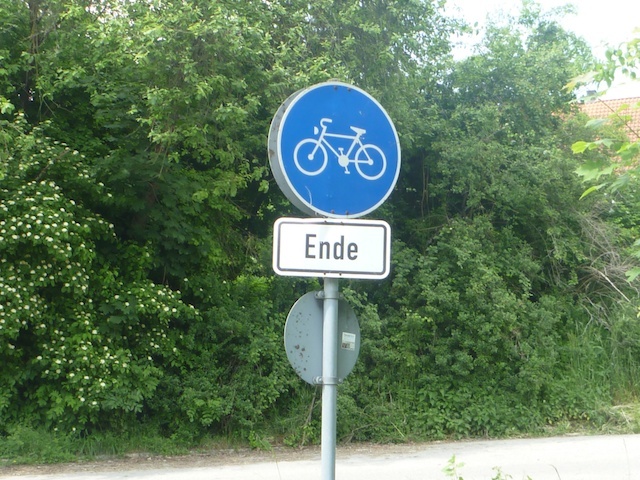 Although there were bike paths, they did not follow the entire route. As we approached Bad Tolz, traffic did pick up, but we were never honked at, nor were we passed in an unsafe manner. 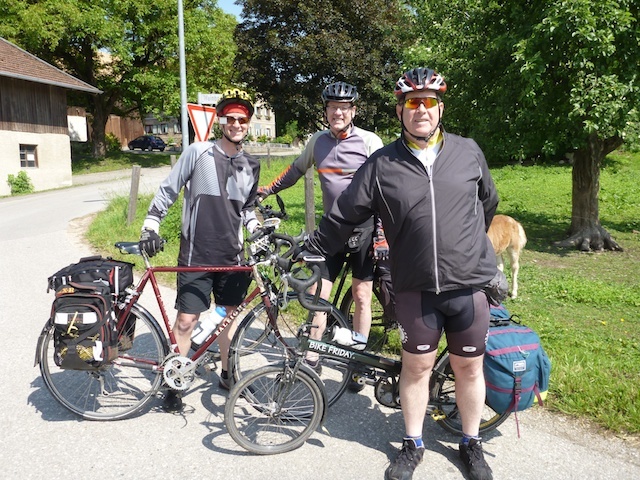 Just as we were arriving into Bad Tolz from the north, we were presented with one more short climb, but the bike path resumed and took us down by the river to our hotel, Hotel Lindorf. Today started off much as yesterday, with rain in the forecast. This did not materialize until after we had 25 km under our belts. The route out of Bad Tolz was a bit confusing, as both Brent's GPS and my GPS seemed to have us going around in circles. This is evidenced by the number of map links I have posted. 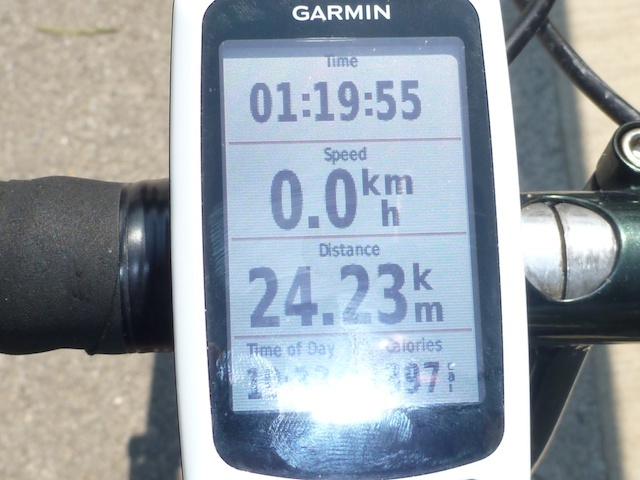 I was still getting used to the little quirks of the Garmin Edge. Even after leaving the city, my GPS wanted to return us to the start point. About half way along it finally seemed to "smarten up", and direct us on the proper paths. The nice thing about the GPS units is they directed us along paths and roads we would not normally have taken. 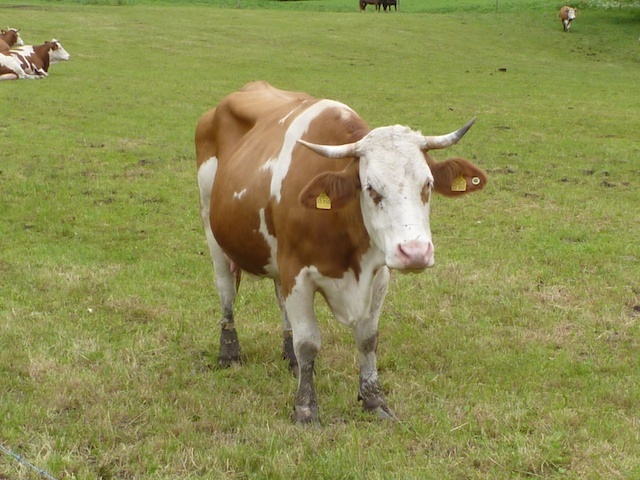 This brought us through lands with quiet farm fields, through wooded farmland, and along roads the normal traveller would not take. On the flip side of the coin, we were subjected to some steep climbs all three of us would have preferred not to have taken. All three of us ended walking up a few of the steeper, longer hills. 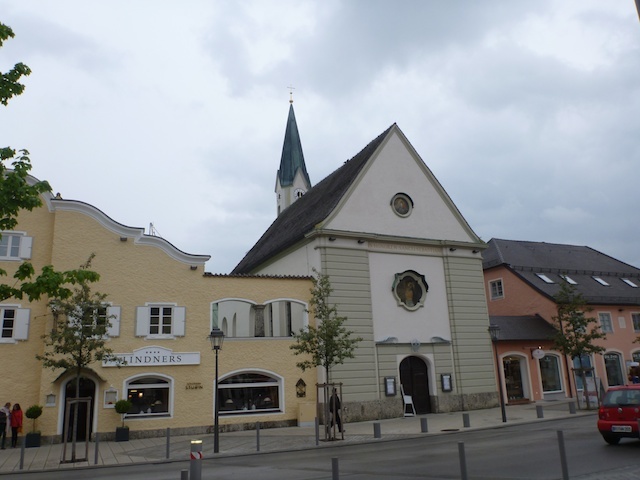 As the day was raining, we changed our original destination from Bad Feilnbach to Bad Aibling. It took a while to reprogram our GPS units, and we were soon climbing again. At the top of the hill, with only 18 km left to go, we started the most amazing descent. I was worried we might be on the wrong road, and would have to climb all the way back up. 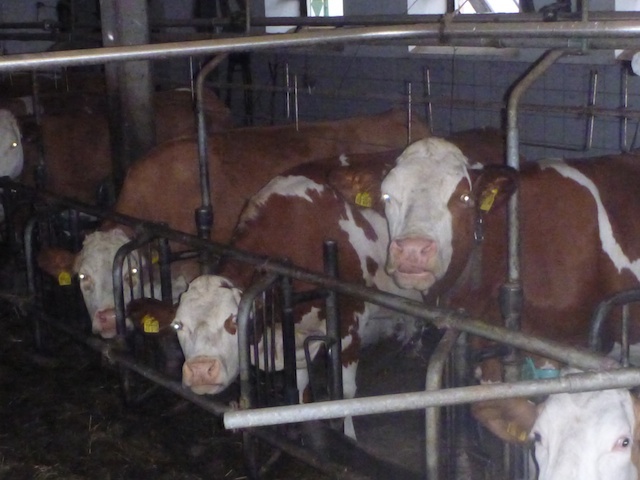 The biggest part of the descent began in front of a dairy farm. 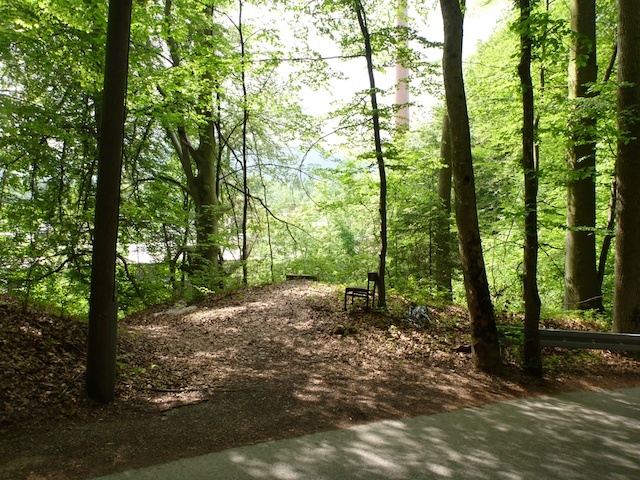 It looked more or less like a paved bike path through a forest. Only it was about a 14% grade. Because it was wet, rainy, and we were unfamiliar with the pathway, all three of us rode most of the way down with full brakes on - max speed (by Kevin, of course) was 57 kph. 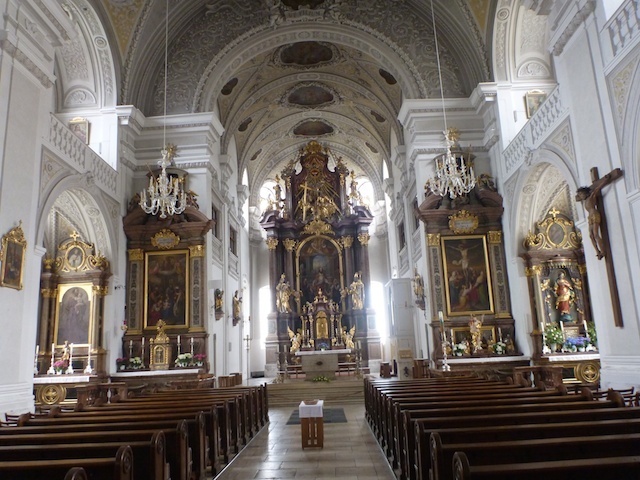 The road went downhill for most of 10 km, and we were soon in the small town of Bad Aibling. After arriving, we started to look for a place to stay. 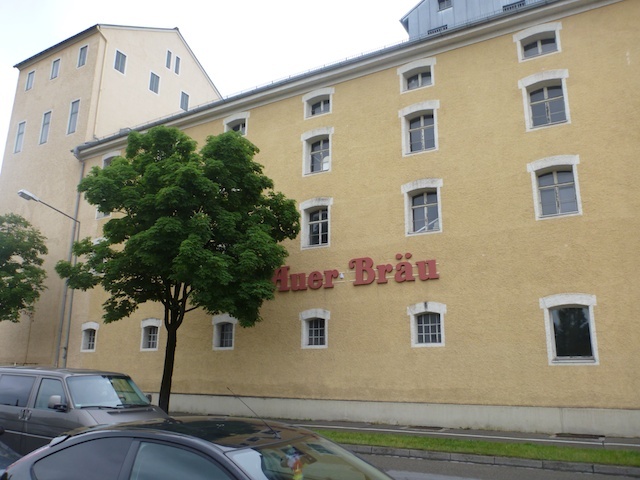 We saw no signs for hotels or Zimmer freis on the way in. In fact, the town looked quite sleepy, with almost every business and restaurant closed. We found one hotel, only to discover that they were no longer a hotel, but a restaurant. We stopped at a very nice looking pension to find out they were full. 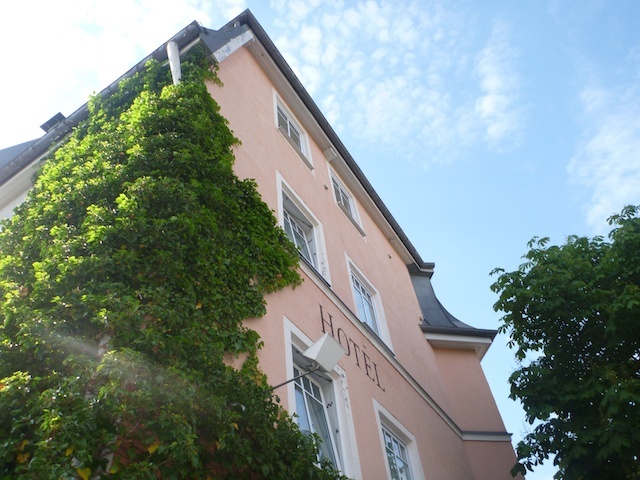 The next establishment we discovered was Hotel Johannisbad. 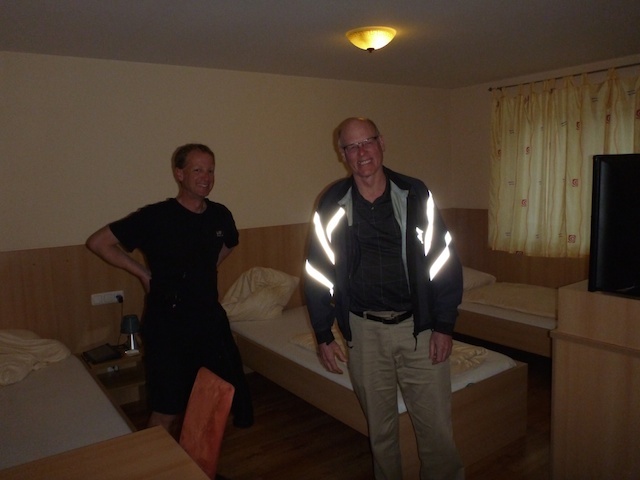 The Innkeeper said they did not have any rooms for 3, but we could get a double, with a cot for €101. We took it. After showering and addressing emails and such, we left to find something to eat. Every single restaurant that we came upon, other than small coffee shops were closed. On our way back we stopped at a bar/pizza shop that had just reopened for the evening. We were treated to a delicious dinner of pork chops covered in mushroom gravy, mushrooms and onions, and French fries. The house salad was very fresh, and had a oil and mayonnaise salad dressing. 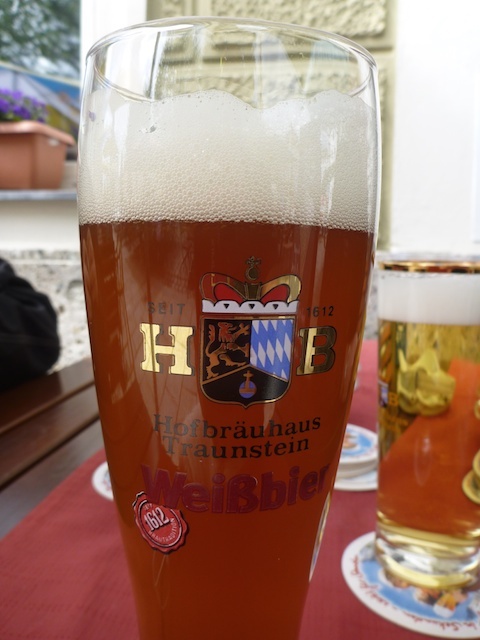 We washed it down with some Dunkel Weissebier. 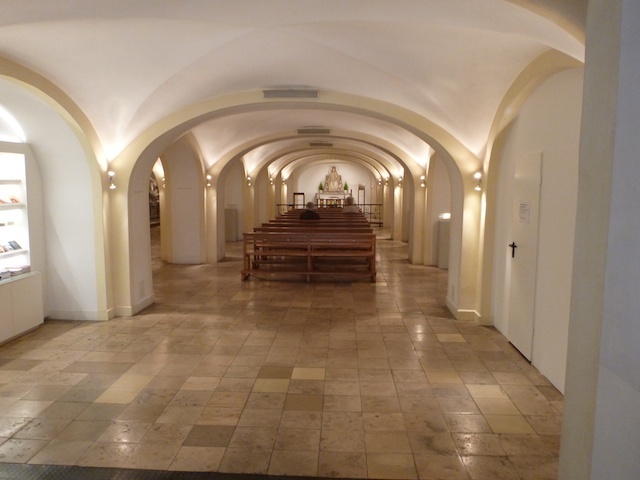 We found out the reason for most of the stores and restaurants being closed - this was Father's Day in Germany. Apparently it is a much bigger deal than it is in Canada. It was also a big factor in planning our next day. 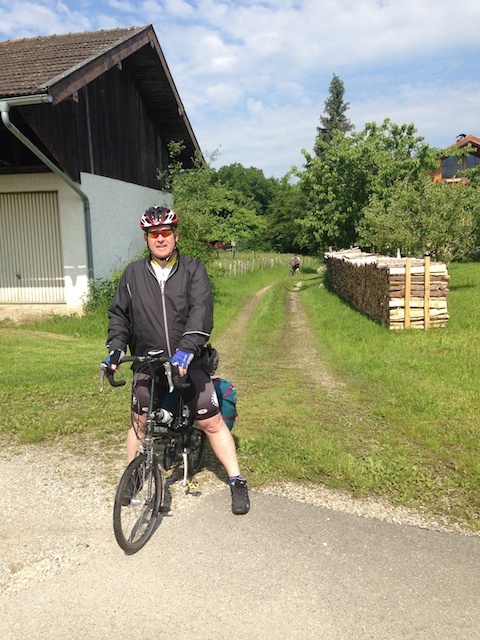 Day 5 was planned with a short, leisurely ride into the resort of Prien am Chiemsee. With the holiday weekend looming (an extension of Father's Day), we were finding it extremely difficult to find accomodations close by the lake. 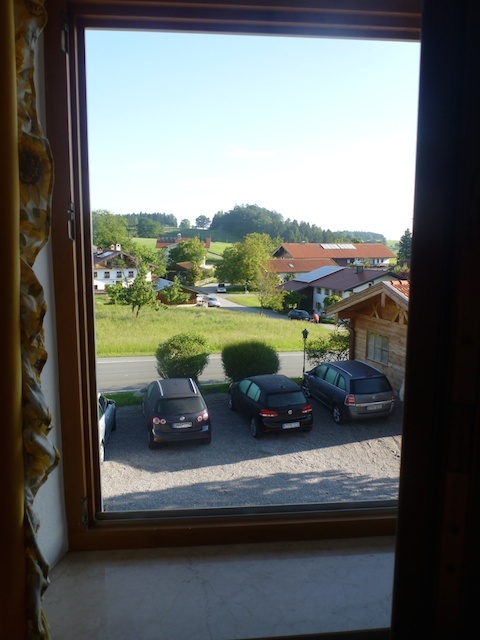 We ended up settling on a hotel located approximately 20 km away from the lake, which would still allow us to view the lake. My side trip to mad Kind Ludwig's version of Versailles - Herrenchiemsee on the island in Lake Chiemsee would have to be deferred until a later trip. Total mileage for the day: 50.6 km. Temperature: 16C. 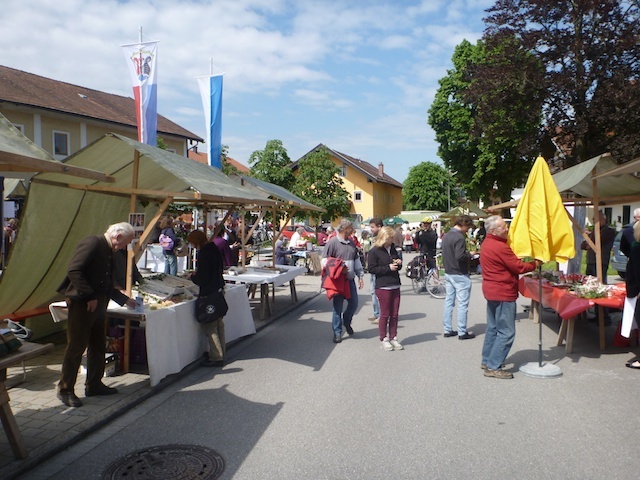 Standoff with one of the "Locals"
Bad Aibling is deserted ... it's "Father's Day" in Deutschland! The rain had fallen all night long. Even at 8:00 a.m. the rain, even though it had slowed to a steady drizzle would have made for a miserable ride. At 0830 Tom and I followed Brent down to breakfast (where he had gone at 0730). We prepared to start riding at about 1030. The rain miraculously stopped, although the roads were still quite wet. Thank goodness for fenders (which everyone had installed on their bikes). 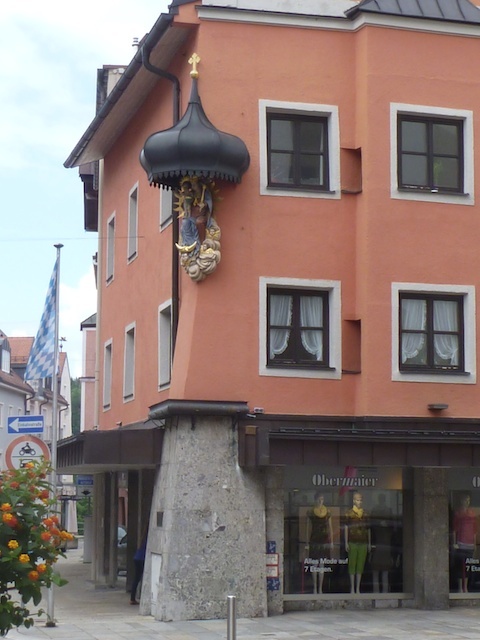 With GPS units programmed to take us to our hotel, the Goldener Pflug in The little village of Umrathshausen, we were soon on our way. It only took us 30 seconds to make our first wrong turn on the roundabout by our hotel. Brent will probably correct me here - I was the one who took the wrong turn, and unfortunately Tom followed like a lost sheep (he had no maps or GPS). Brent laughed at us as we reversed course back to the hotel and followed his lead. Quickly corrected, we proceeded on our way. 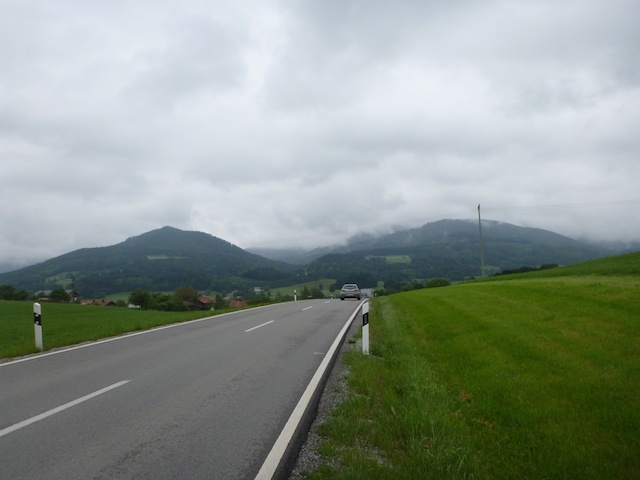 We immediately started a fairly shallow climb out of town, and eventually our ride found it's way on flat roads towards the city of Rosenheim. 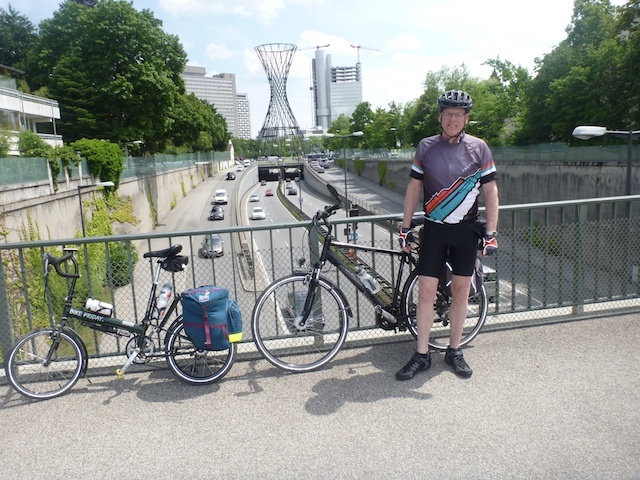 The size of this city actually surprised us, but the ride was pleasant along bike paths painted on the road itself, or adjacent to the sidewalk. Along the way, Brent stopped at a bike shop where they gave him some lube for his chain. 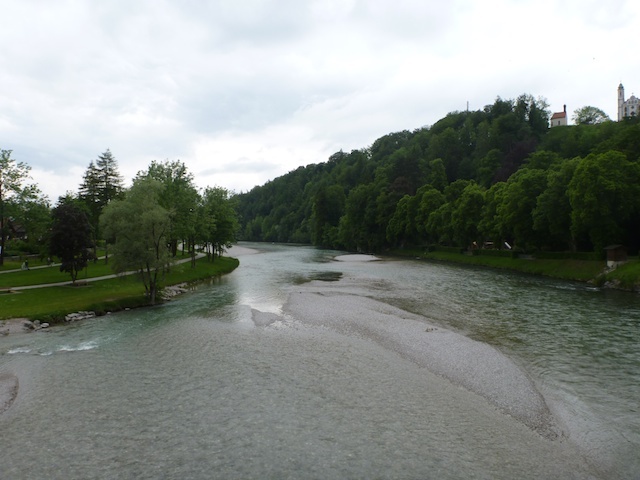 In Rosenheim, we met a cyclist on the pathway, and he told us we could either cycle up the Simssee River to the north-west, or directly to our hotel. We chose the route of least confusion. Soon we were in our lowest gears grinding our way up a very steep section of road. The incline went on for over 3 km. it was certainly detrimental to our average speed. 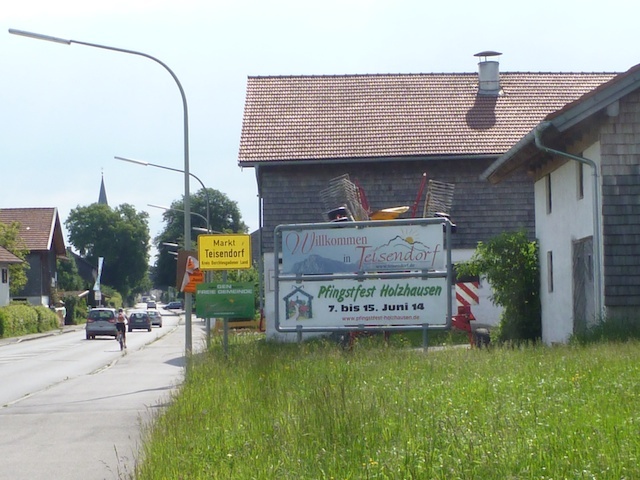 After cresting the hill, we were presented with a nice downhill into the town of Farsdorf, which was just by the busy A8 highway. We decided to stop for lunch at an Italian restaurant, where we split 2 pizzas and had a refreshing "raddler" beer - beer mixed with lemonaide. The hotel was only another 4 kilometres away. 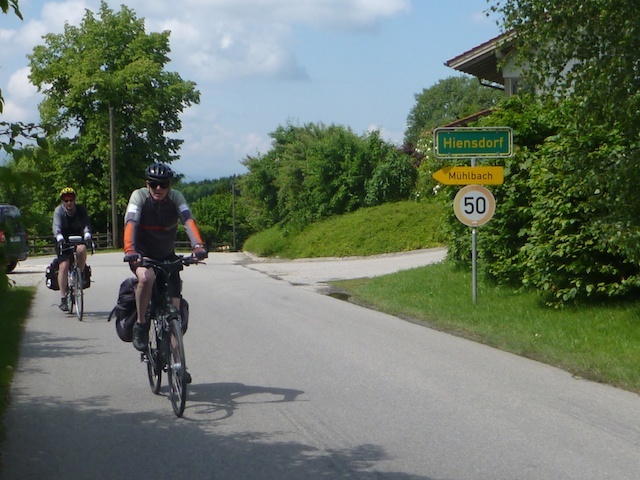 The last 1/2 km was once again up a hill, where we rode into the very small town of Unrathshausen. The hotel seemed vacant when we arrived at 1430. Actually it was vacant. There was very few staff to be seen. The housecleaning staff were busy readying rooms, and the checkin staff woiuld be along shortly. While waiting, we explored the small town. 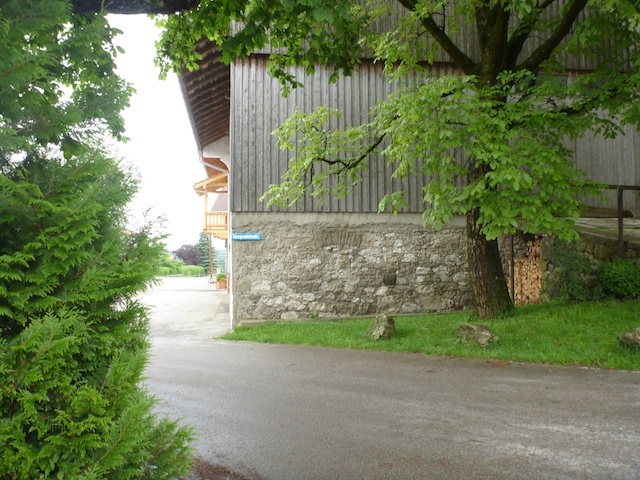 Across the road was a church, and two cattle farms. 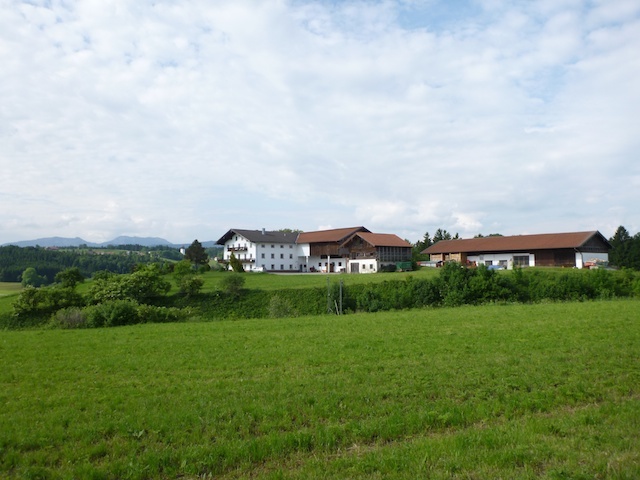 It seemed strange to us to have farms so close to a hotel, but it seems to work over in Germany. 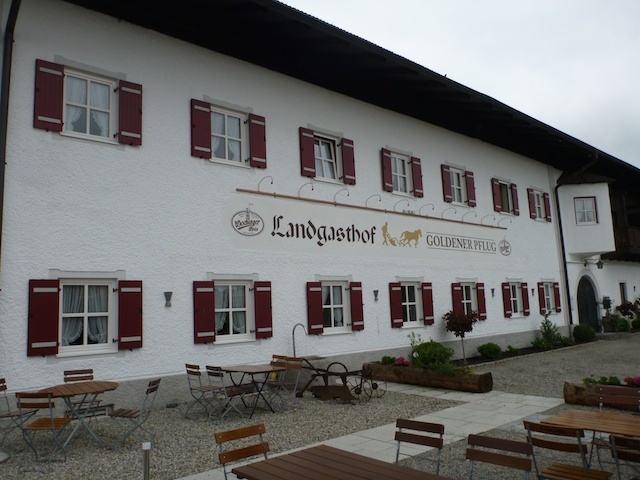 The hotel itself - the Goldener Pflug was very impressive both inside and out, and included a nice bar and restaurant area. 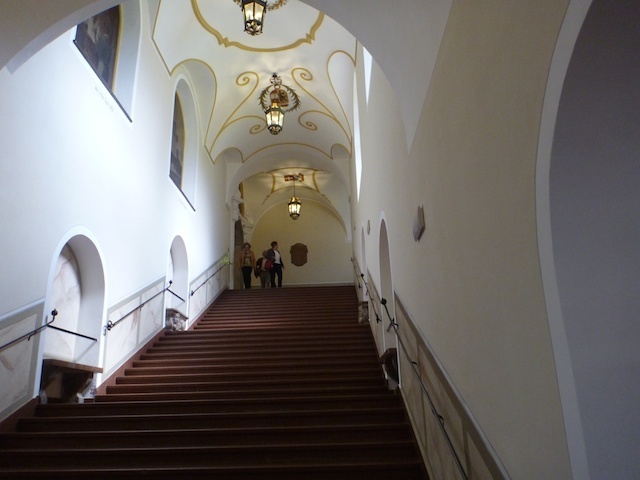 The women who checked us in showed us the door to the hallway leading to our room. When she tried to open the door, you could hear parts of the mechanics falling on the floor. The doorknob turned, but the door would not open. Brent went and got some tools and quickly had the door back in operating condition. As a reward the woman offered us samples of schnapps. We refused, wanting just to get showered off after our ride. 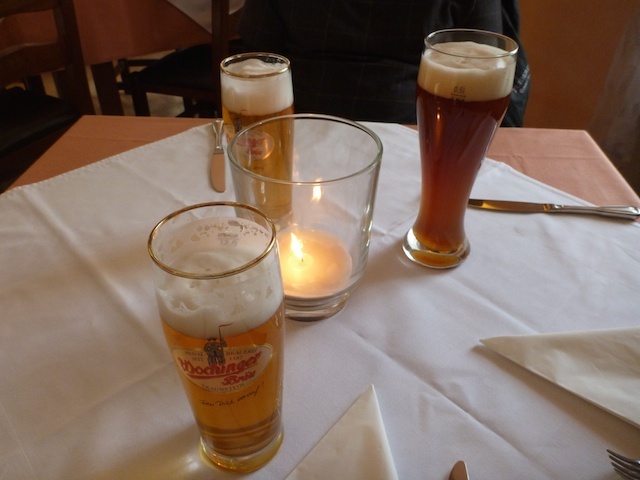 After our showers we proceeded downstairs for dinner and the customary German style beer. Other than the hotel, a church, a few houses and several large farms, there seemed to be not much happening in this sleepy little village. Total distance: 29.2 km, Time: 1:55, average 15.17 kph, total climb: 476 metres, descent: 314 metres. Coming home after our walk about town. Today started out a bit different from all the others. There was blue sky, yellow sun, and only a few cotton-ball plugs of cloud in the sky. While the cars outside were covered in dew, and the temperature only 10C, the sun quickly warmed us up. We made a right turn out of the hotel on to the "main drag" and we were on our way. Soon we we were climbing, but the grade was quite low, so it presented no problems. 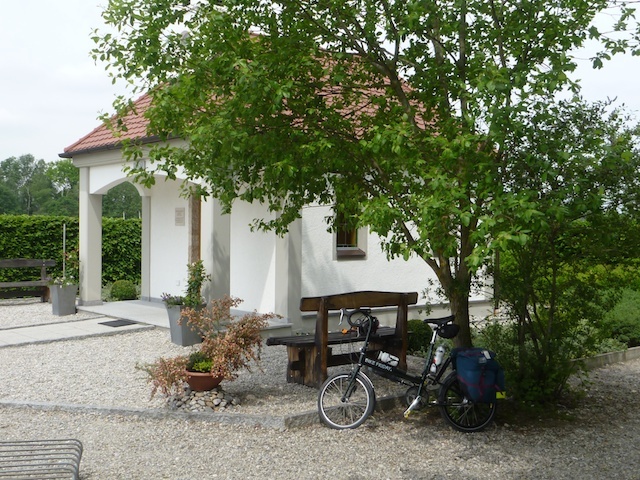 A couple kilometres along the road we veered slightly to the right and acquired a quiet bike path through the middle of quaint villages. 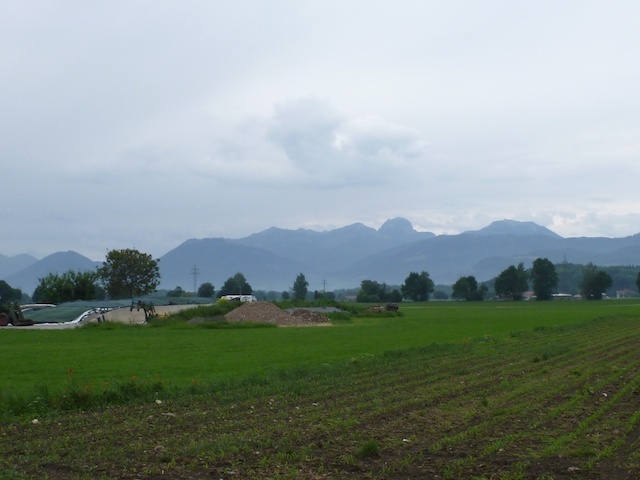 After a gorgeous downhill section we saw our first view of Chiemsee Lake. It was spectacular. Everyone stopped for photo opportunities - the so called "Kodak" moment. 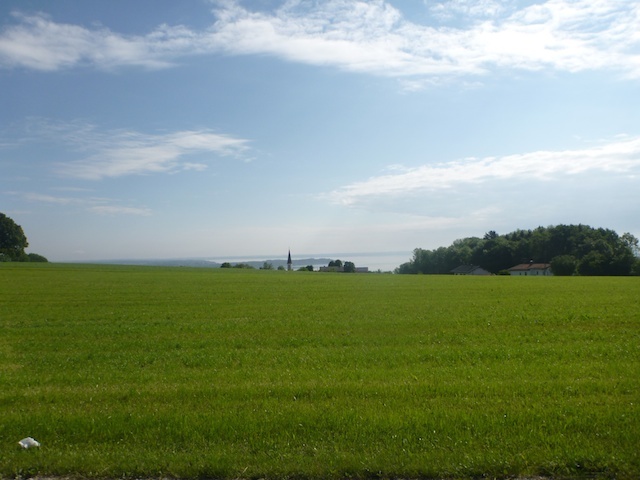 (Reference #259/743)We continued downhill towards the lake, mostly on quiet bike paths, with a few busy sections of road interspersed. 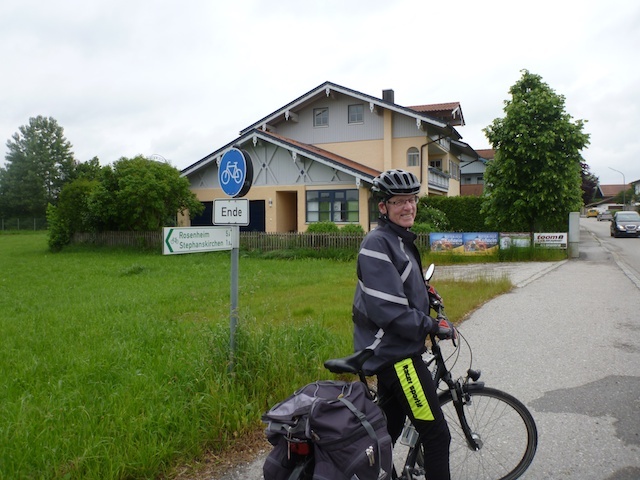 Eventually, we crossed the busy A8 autobahn and we were on a very nice bike path at the south end of Chiemsee, although it was still next to the autobahn. Down on the south end of the lake the scenery actually was quite uninspiring - mostly swampy areas interspersed with crop and cattle farming, and a few nice views of one of Germany's largest fresh water lakes (look this up, as I believe I saw that it actually was the biggest in Germany). 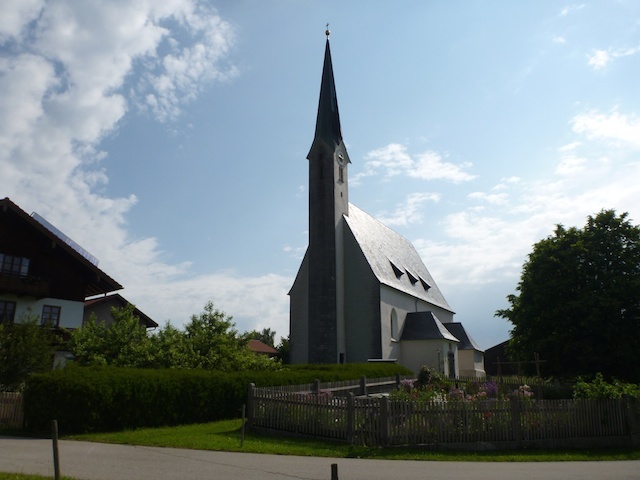 After we had circumnavigated the south end of Lake Chiemsee, we arrived in the village of Grabenstatt. 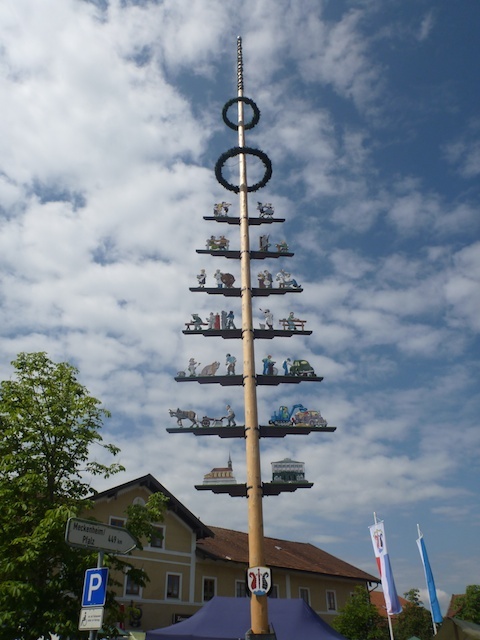 We could look back from this elevated village and see almost all of Lake Chiemsee. We came upon a small village bazaar, where the street was blocked off. Local villagers were selling mostly local handicrafts and local foods. 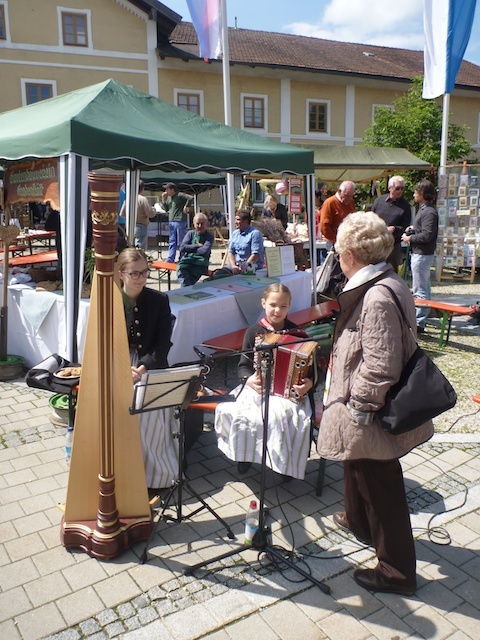 And there was even a bit of local entertainment in the form of a couple very young ladies singing and playing on the harp. 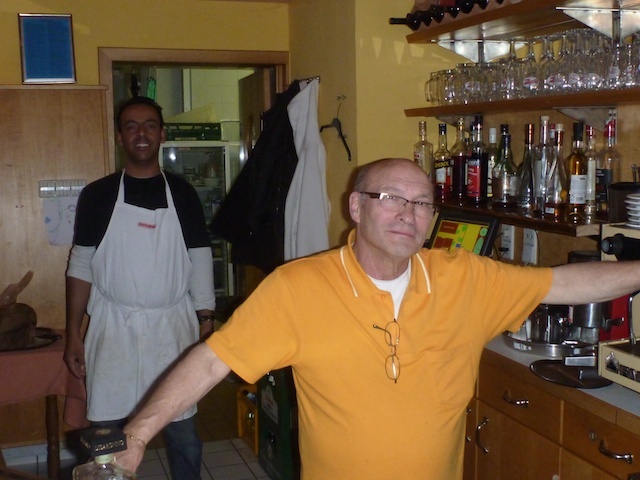 We bought a few pastries, and ordered cappuccinos at the local bar, the Taverna Oregano. We sat and had a nice break from cycling, and we enjoyed the festivities. (Photos 268 - 274). 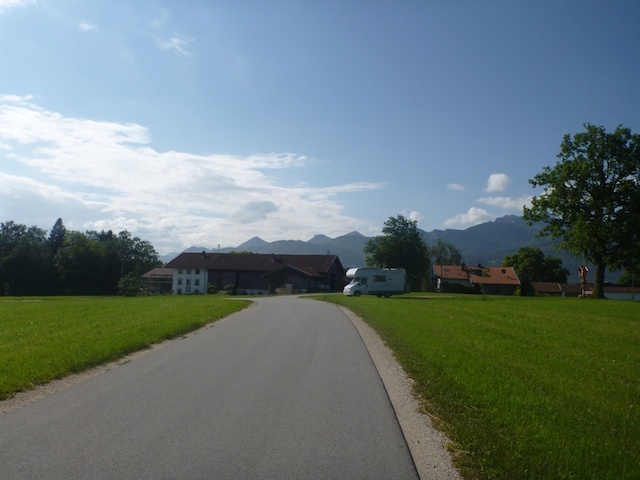 We continued on our way through gently rolling and very green countryside for another 10 km, reaching our destination, the town of Traunstein at about 12:15 pm. We cycled around a bit, having a hard time finding a hotel. Not that they were full - we simply could not find them. 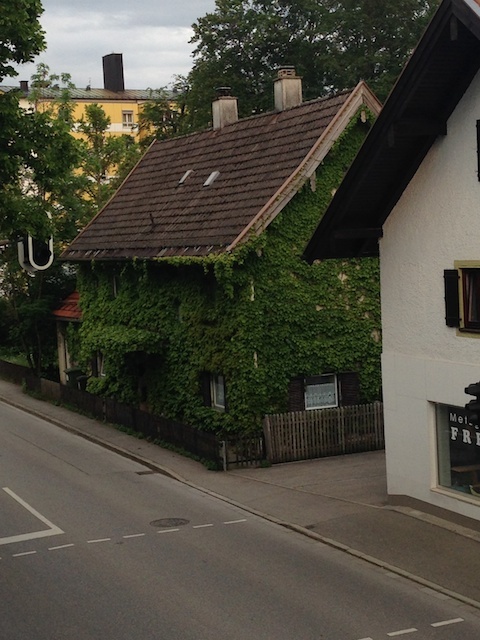 I finally programmed the GPS for "accommodation", and it took us to the 3 Star Superior hotel, Park Hotel Traunstein. Tom and Brent quickly came out and indicated the rooms were very expensive (we would need 2), but they did have the address of another hotel just around the corner, only two blocks away by the train station. 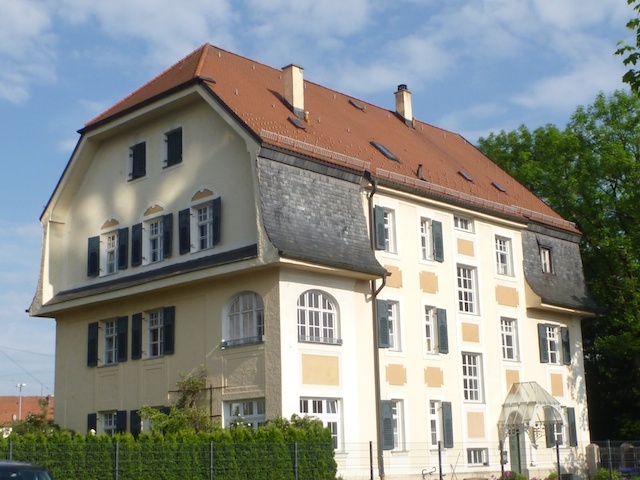 The Rosenheimer Hof would be our base of operations for the night. After settling into our hotel and taking the obligatory shower, we wandered to the downtown area for some picture taking. 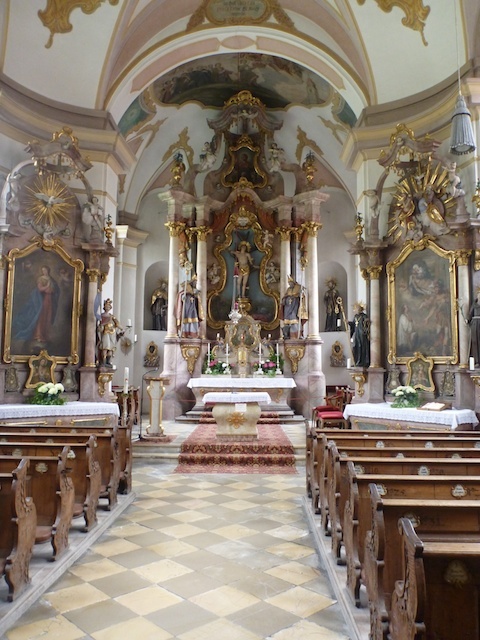 This region was very proud of its Catholic religious history. 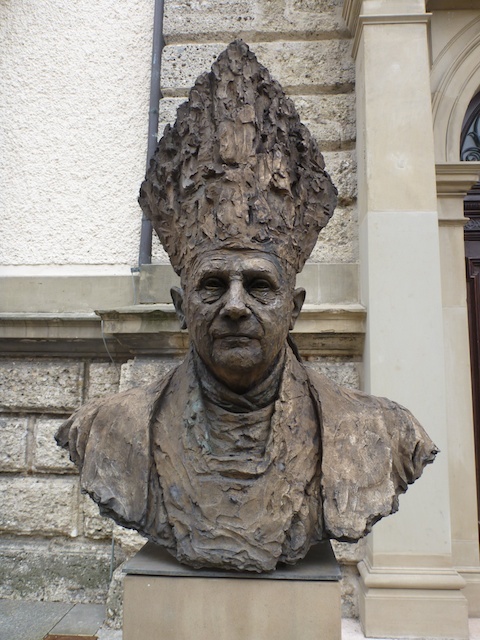 It's regional Bishop (Munich and Freising) eventually became Pope Benedict. 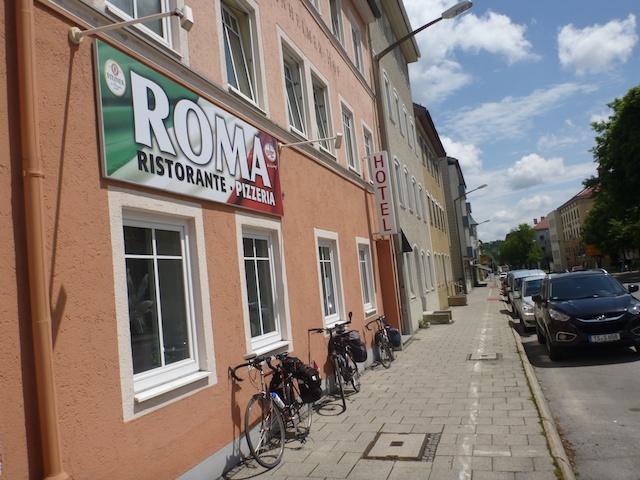 Returning to the hotel, we all had an excellent dinner provided at the Roma Ristorante located downstairs. 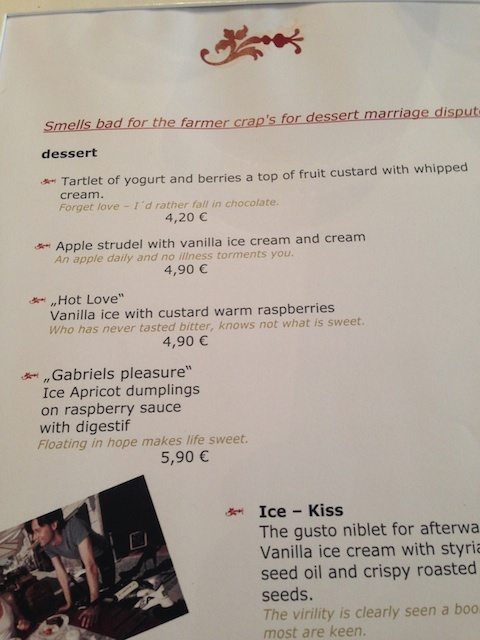 Even though Tom always seemed to struggle through the main course, he always seemed to find room for dessert. This always made Brent and I laugh. Tom after riding through the "tunnel of trees"
Once again we were blessed with early morning sunshine for the start of our ride. 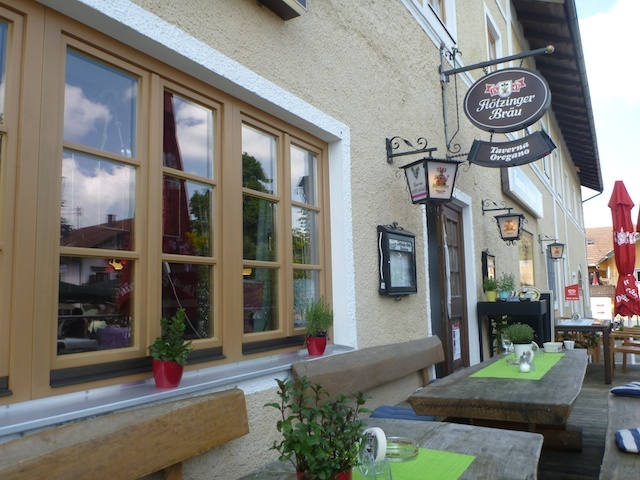 After the usual German breakfast consisting of buns, meats, cheese, boiled egg, and fruits and yoghurt, we were again on our way. 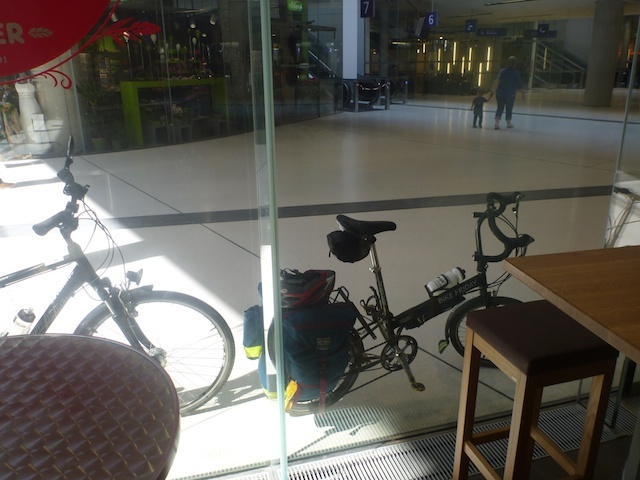 We retrieved our bikes from the garage, loaded our panniers and "saddled" up. Today was a short ride of only 38.2 km. 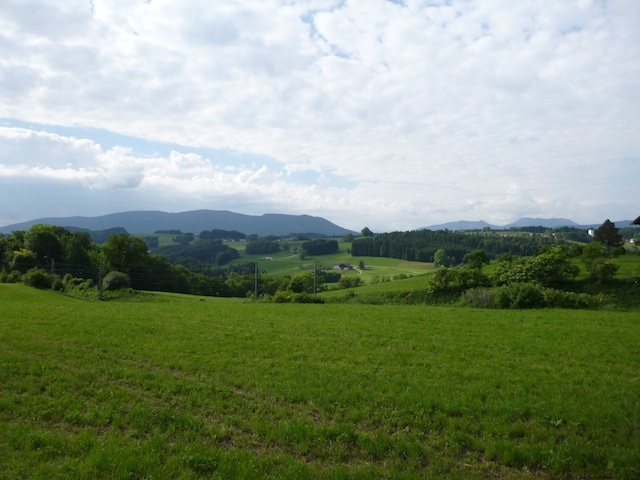 The terrain was gently rolling with only one or two memorable hills. 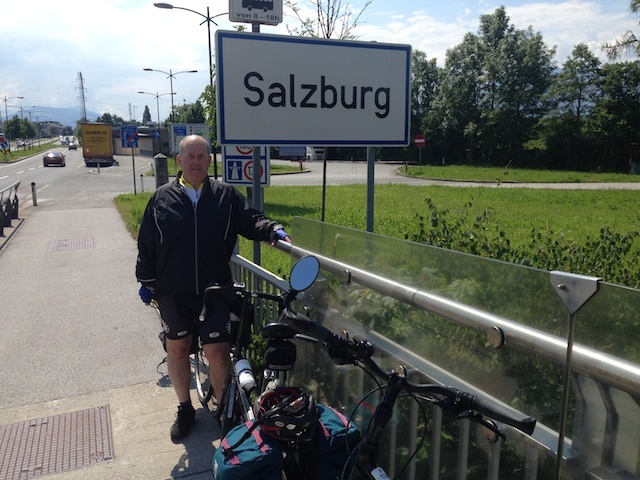 For today's ride I simply plugged the Salzburg hotel address into the GPS and let it go. I did not restrict the GPS to paved roads only, and it started to take us down a gravel path, that turned back into a paved path before eventually becoming gravel once again parallel to the railroad lines. After about 500 metres of this, the gravel path took us into dense woods and the path now was that of tractor tires through mud and bush. We discussed our options, had a look at the map and decided to carry on pushing our bikes through forest and uneven ground. According to the map, we had about 500 metres to walk at the most. And the scenery was actually quite lovely. 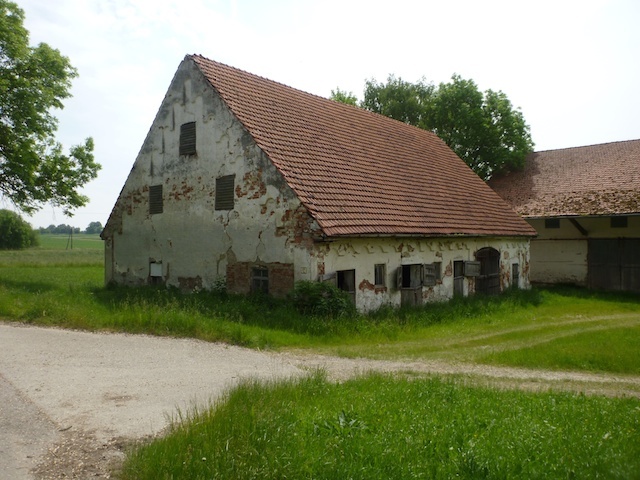 We continued on after consulting the GPS, and eventually reappeared from the forest in a beautiful farm village replete with church, barns, and even some rabbits in cages, as well as a beautiful flower garden. 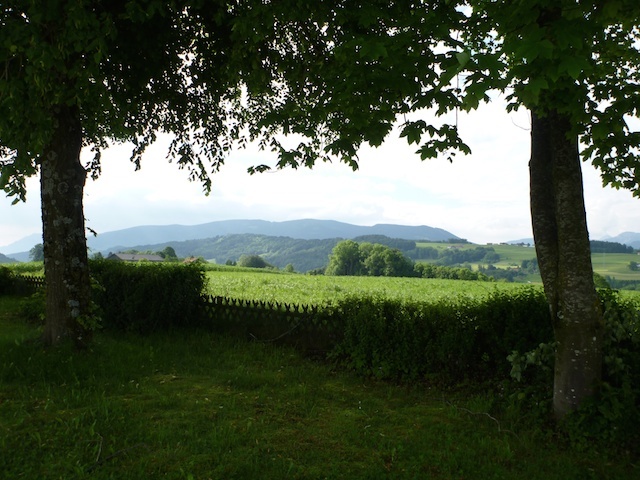 We went through the village of Teisendorf, and were presented with some nice views of the Alps to our south. The GPS directed us along a cycle path - up ahead were a couple horses on the same pathway. So as not to spook them, we made a slow approach - Tom clanging the only bike bell we possessed. I don't think it helped (or hurt) - the horses probably smelt us coming. About 300 metres after passing the horses we came upon a small bridge crossing a creek, followed by horse barns, and several houses that signalled the start of a small town. 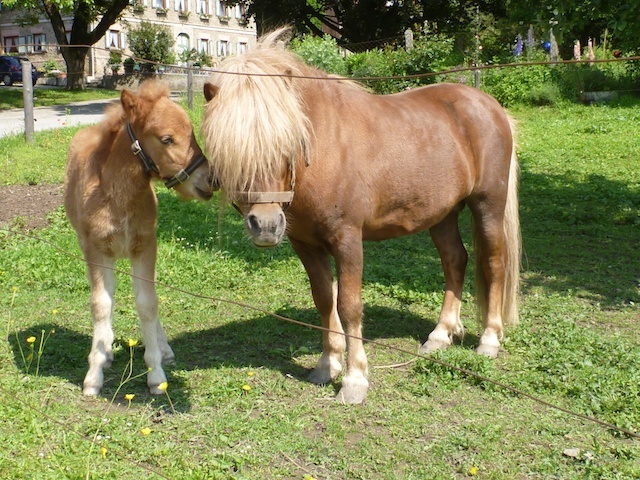 We stopped to take some photos of some pygmy horses, including a relatively new colt. On the other side of the road was a group of four cyclists that were trying to take a group photo of themselves. We volunteered to take their photo, and they reciprocated by taking ours - the only full group shot of us during this trip. 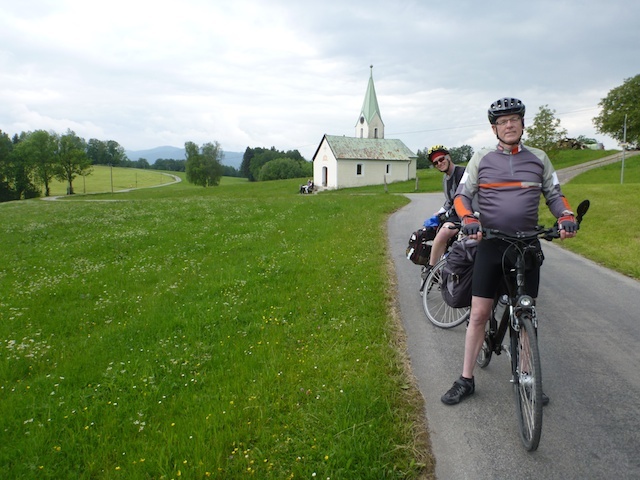 We would end up riding much the same route as them the remainder of the trip into Salzburg, playing a kind of bicycle "hopscotch" along the way. 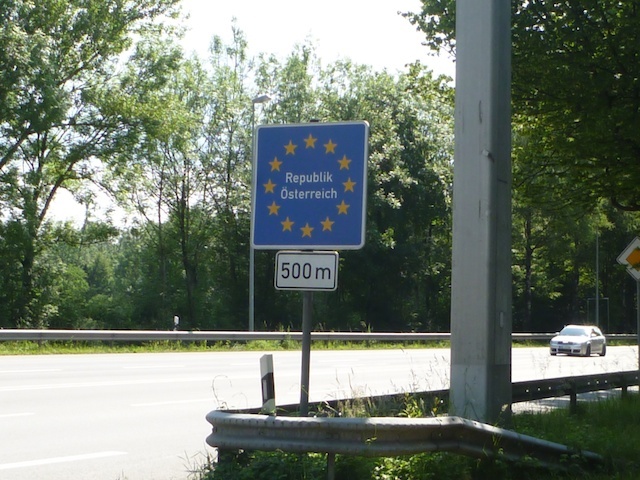 Eventually, we came to a sign indicating the approach of the Austrian border, which is also where the city of Salt - Salburg starts, and once again our cameras were out. We took pictures of the back of Brent, as he was showcasing a Canadian designed jersey with a Canadian flag design on the back. The same jersey design was worn by our Canadian men's curling team during the 2014 Sochi Olympic Games. Brent was justifiably proud of his body-based work of art. 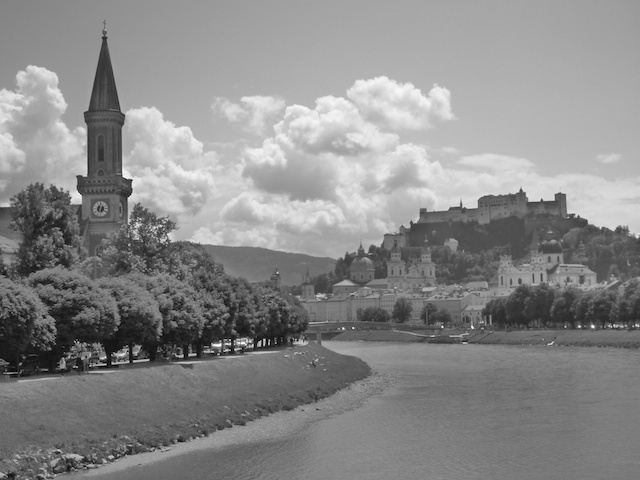 The GPS was initially difficult to use in the city of Salzburg until we got used to it's constant strive to keep us off busy roads. Once it brought us to the downtown area, Brent began to recognize landmarks from his previous visit in 1992. 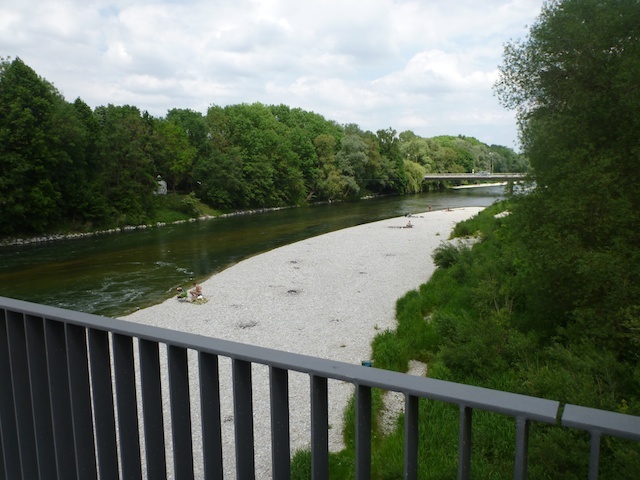 We altered our course from the hotel zone and followed along the Salzach River, which had a nice paved path adjacent to it. 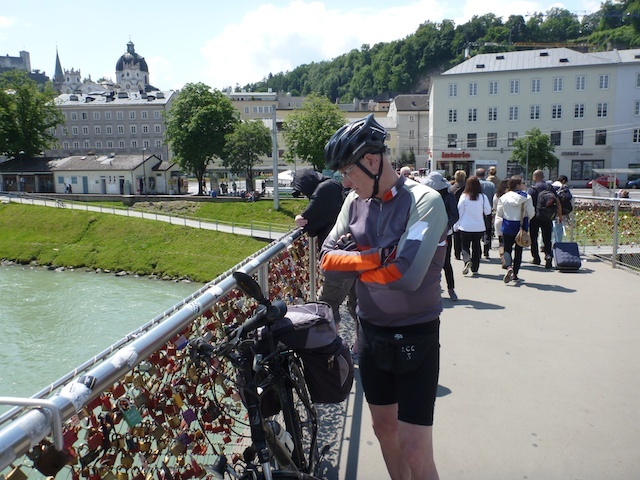 After a bit of cycling, we crossed the river towards our hotel, the Best Western Salzburg. 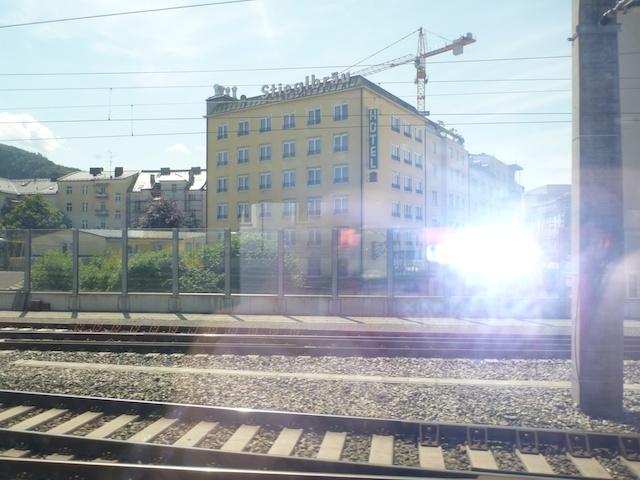 The nice thing about this hotel was that it was very close to the train station, for when we had to make our get-away in a few days. We checked in, and locked up our bike in a downstairs storage area. We were more or less finished the cycling portion of our trip, and were ready for some sightseeing, sans bikes. Our only picture showing all of us in one shot! 500 Metres to our destination! 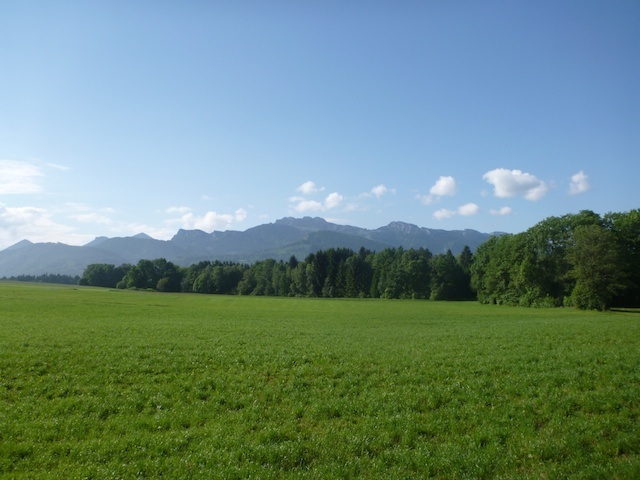 After a few days of vactioning in the Salzburg area (including the Sound of Music Tour, and a bus tour of Hitler's Eagles Nest in Berchtesgaden, Germany we headed on our way back to Munich for our flights home. 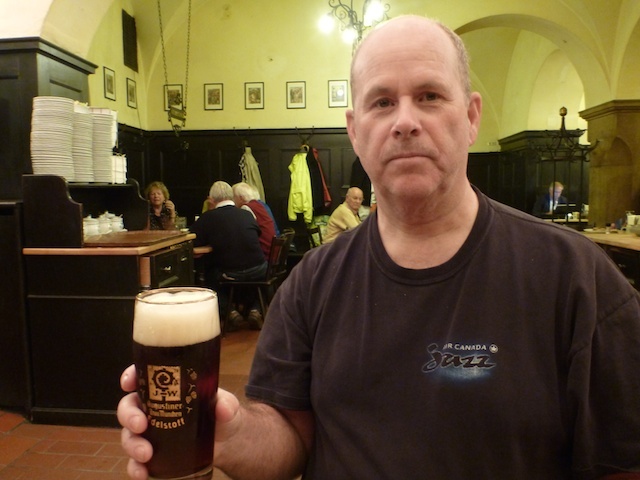 Brent wast leaving on Thursday, so he left Salzburg a day earlier than Tom and I. 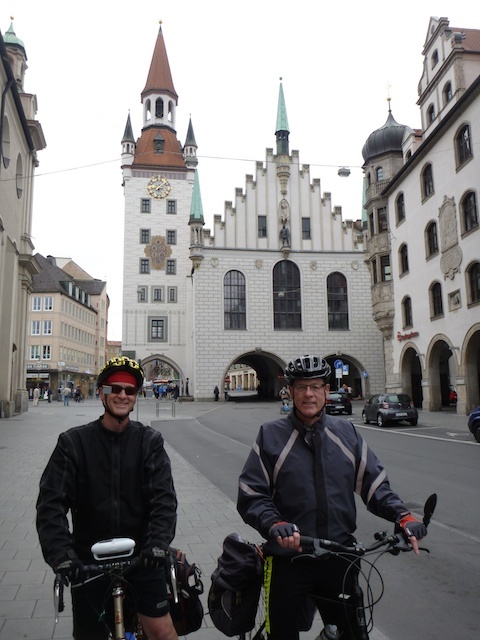 When Tom and I arrived in Munich via train, we felt great, and the weather was conducive to cycling, so we cycled the 27.6 km back to the airport from the train station. 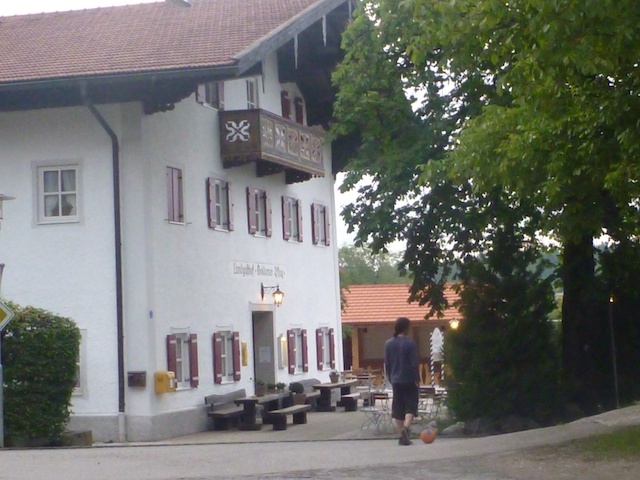 It was an easy ride, and the GPS put us right on track for our hotel in Hallbergmoos, where we would meet Brent. We're on the right path this time!!! 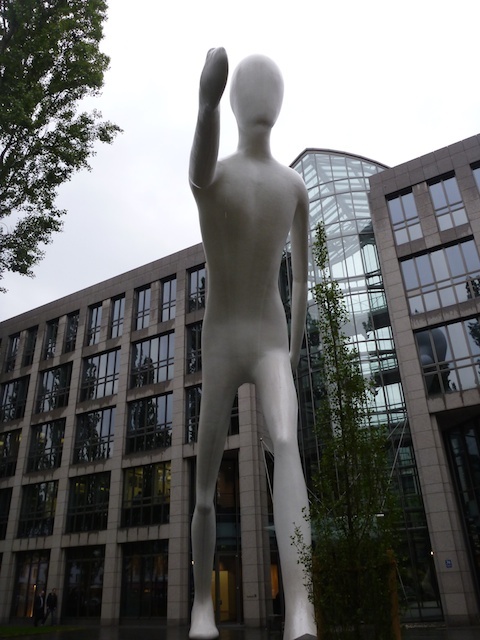 After arriving at the hotel, I decided to ride my bike over the Munich Airport and pack it up for the trip home. I had left my Samsonite suitcase at left luggage, and now I would give them my bike. This trip wasn't too complicated, but it involved going all the way around the airport to the other side. And basically, I was travelling "blind". I had no detailed map of the airport surrounding. 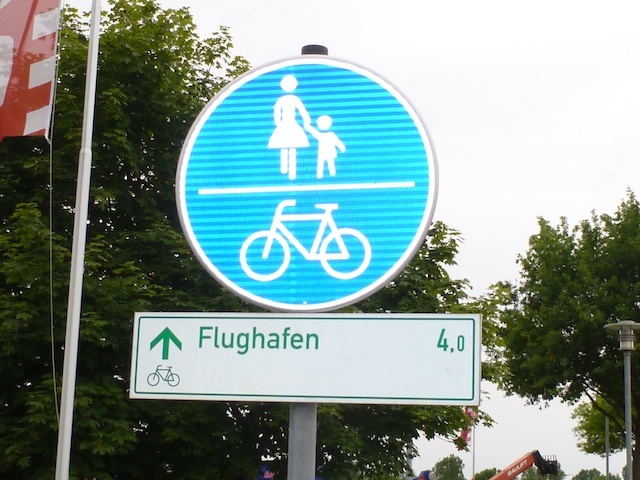 We asked the clerk in the hotel for some information, and they started me out on a bike path towards the airport. I saw another copuple cycling in my direction and I flagged them down and got a bit more info, but for the most part I was on my own. I eventually hit the boundary of the airport and found a gravel road the encircled the south side of the airport. 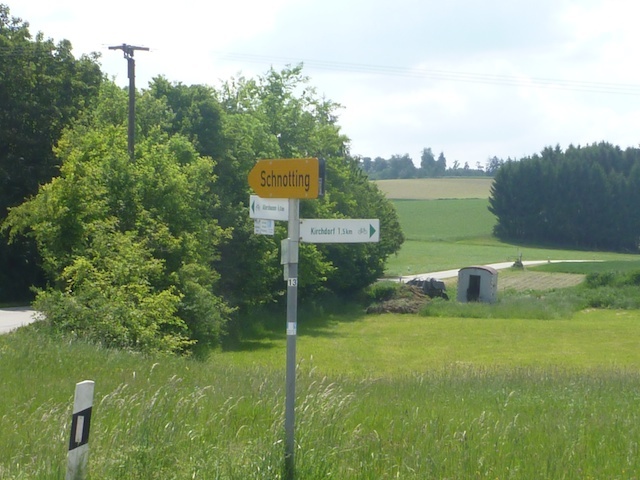 By following this road, I eventually came to the town of Schwaig, and there I found a paved route right into the airport. I began to recognize places I had been only a week earlier when I left the airport. Soon I was at left luggage, and about 25 minutes later my bike was packed and ready to go (much to the surprise of the attendant who thought there was no way I was going to pack a bicycle in a suitcase).